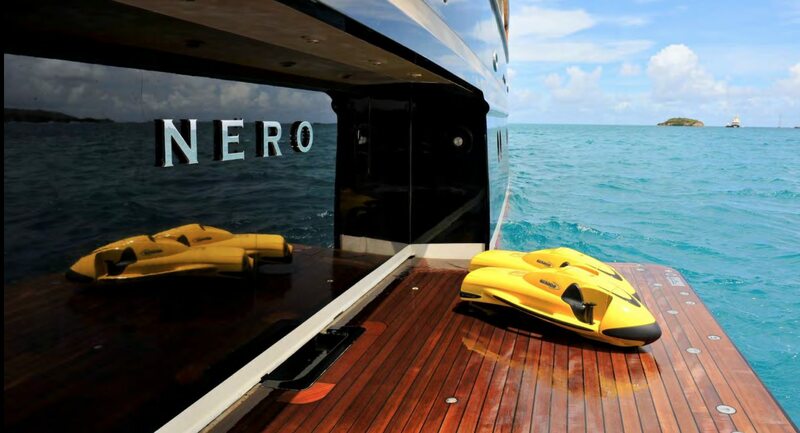 Motor yacht Nero is a 90 meter (295ft) superyacht, built by Corsair Yachts within the Chinese Yantai Raffles shipyard and launched in 2007. 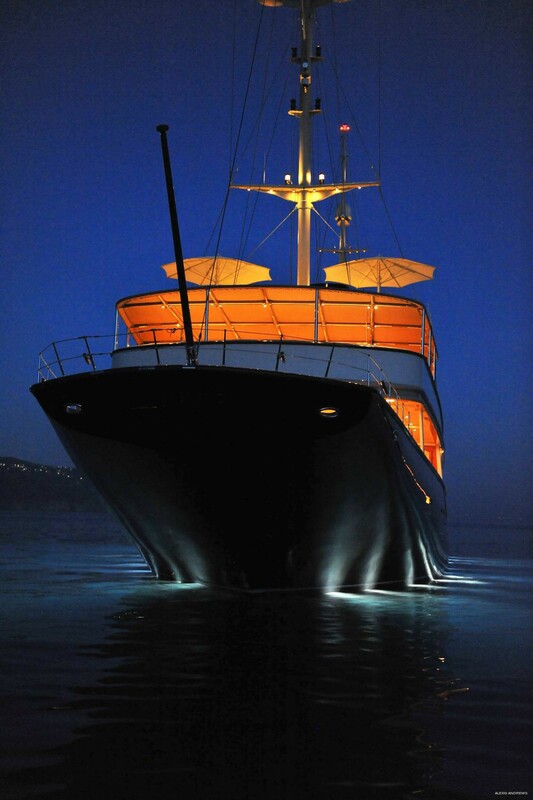 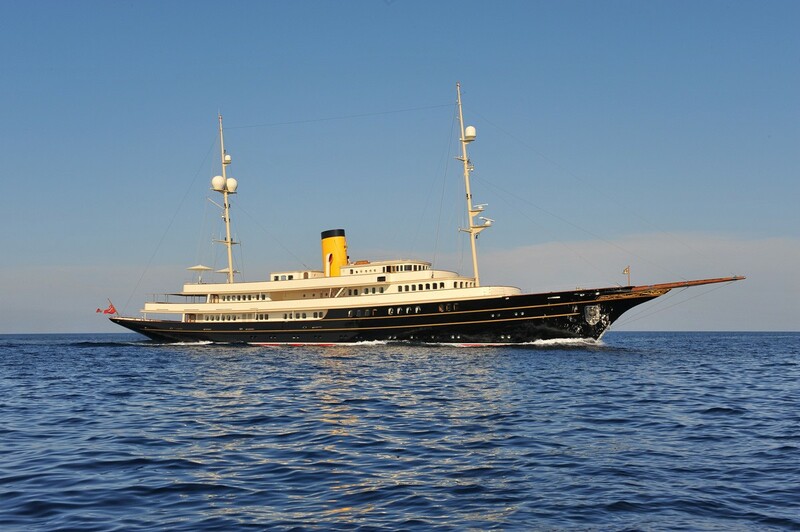 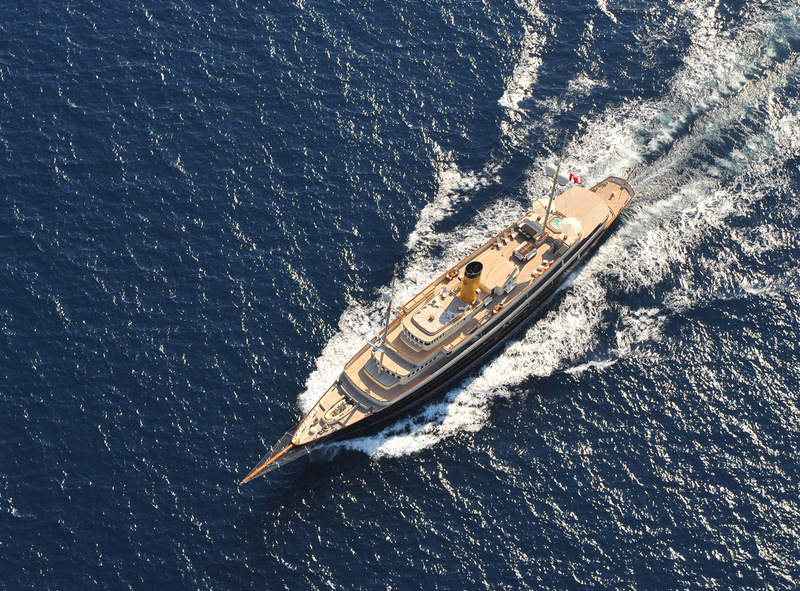 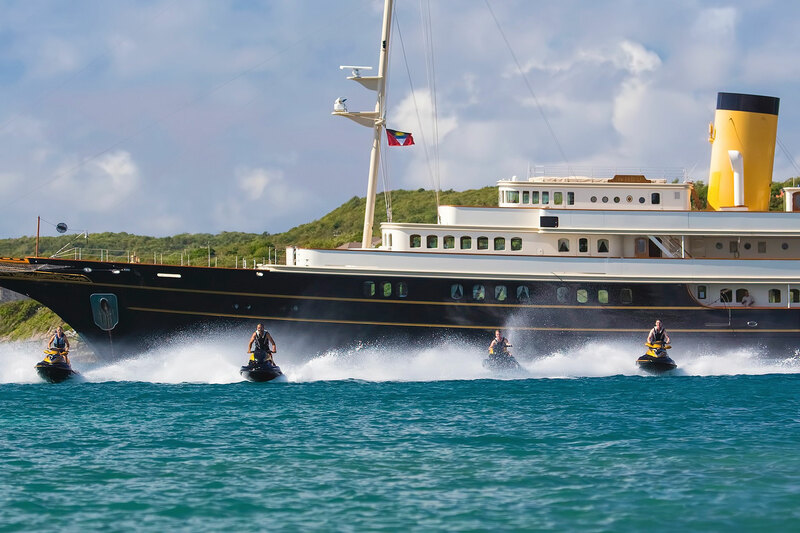 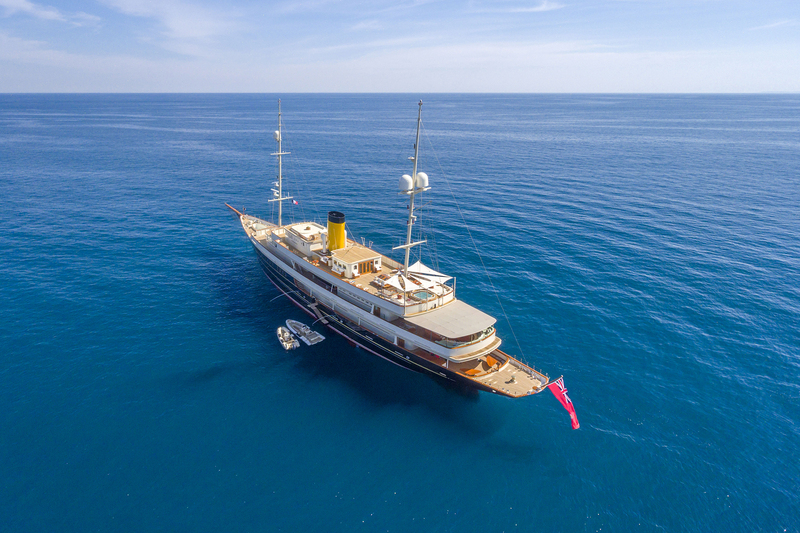 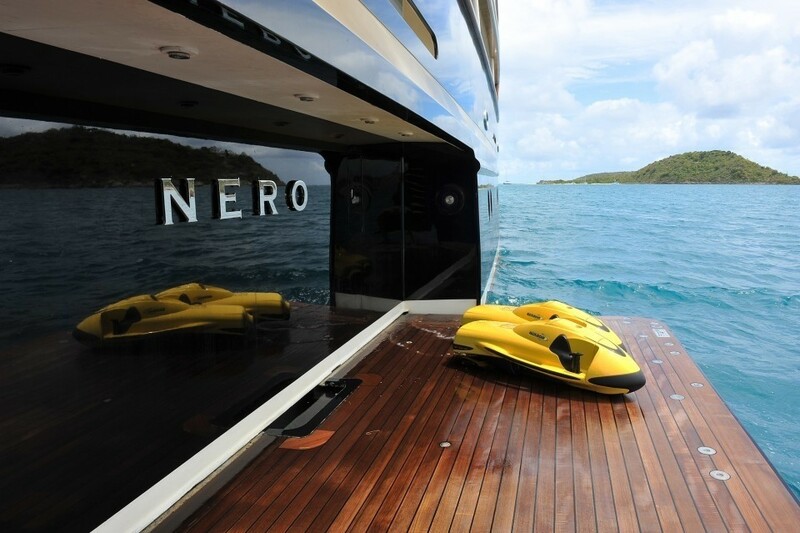 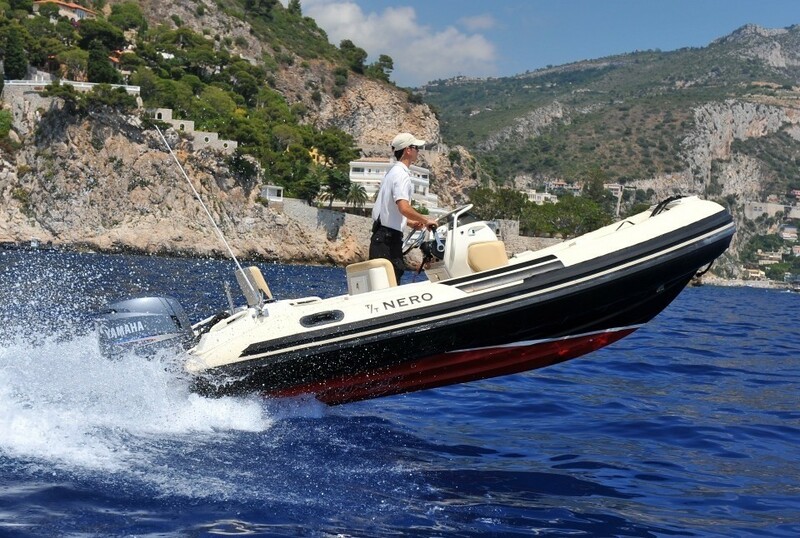 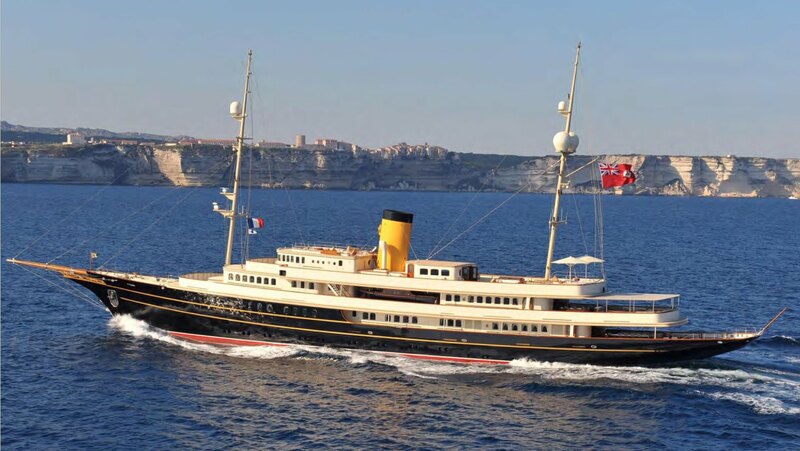 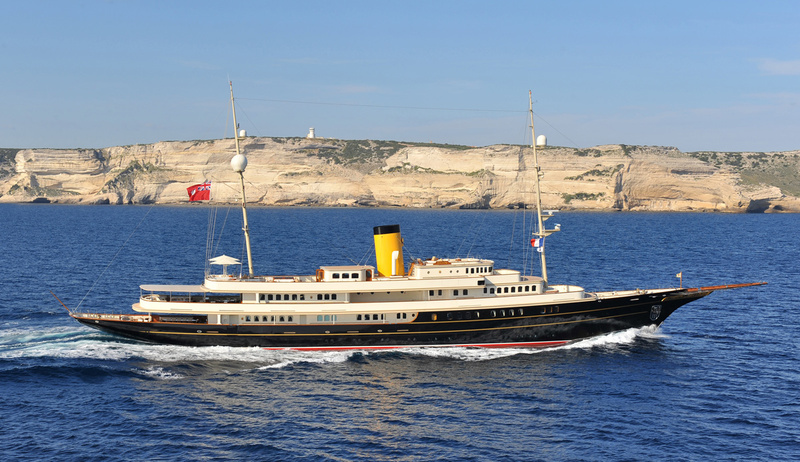 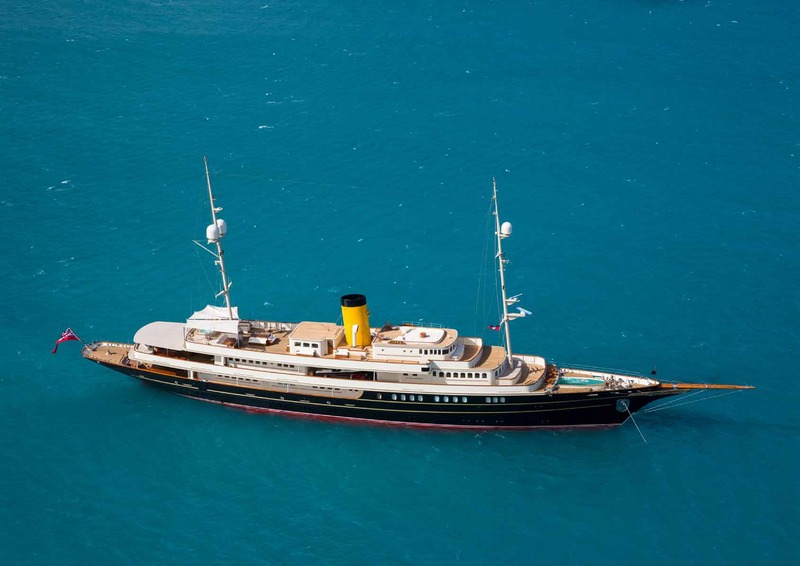 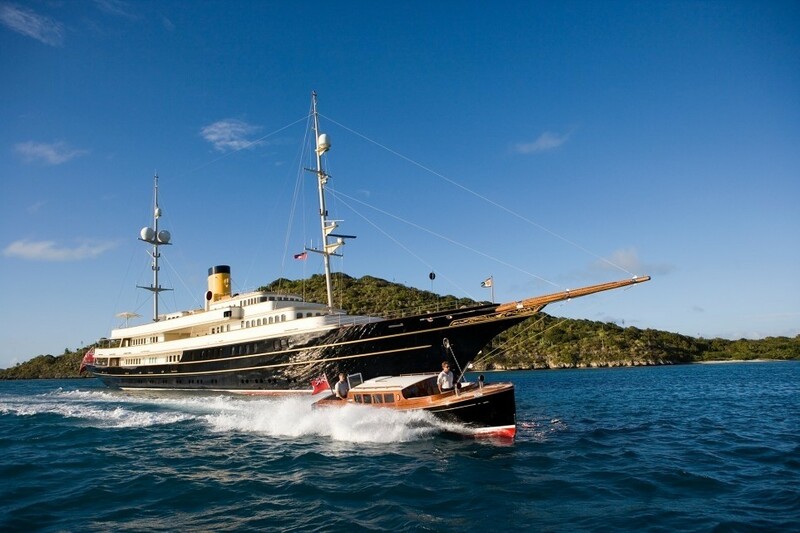 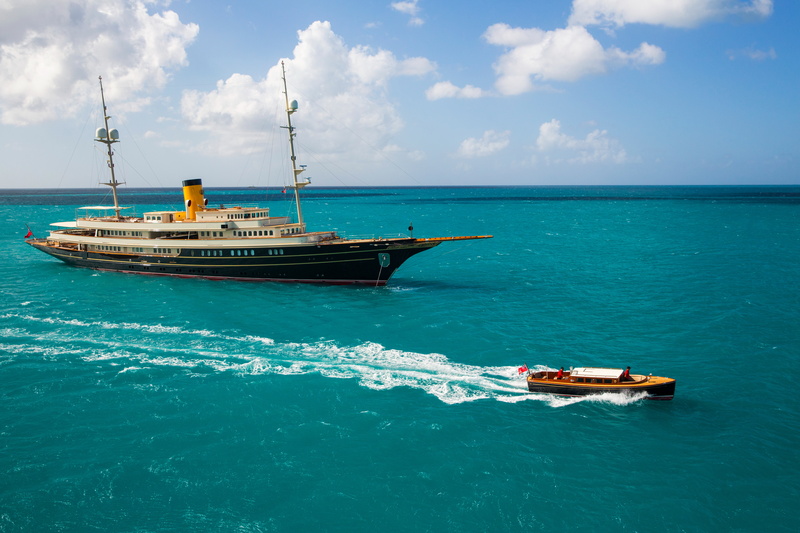 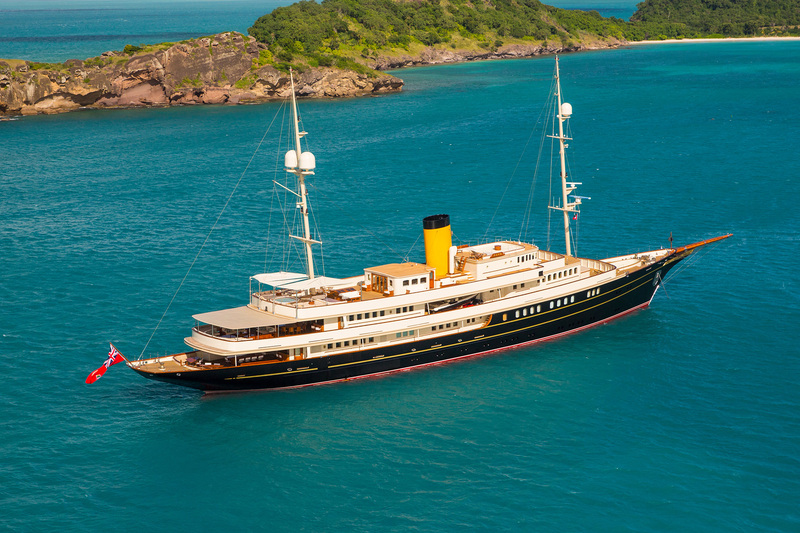 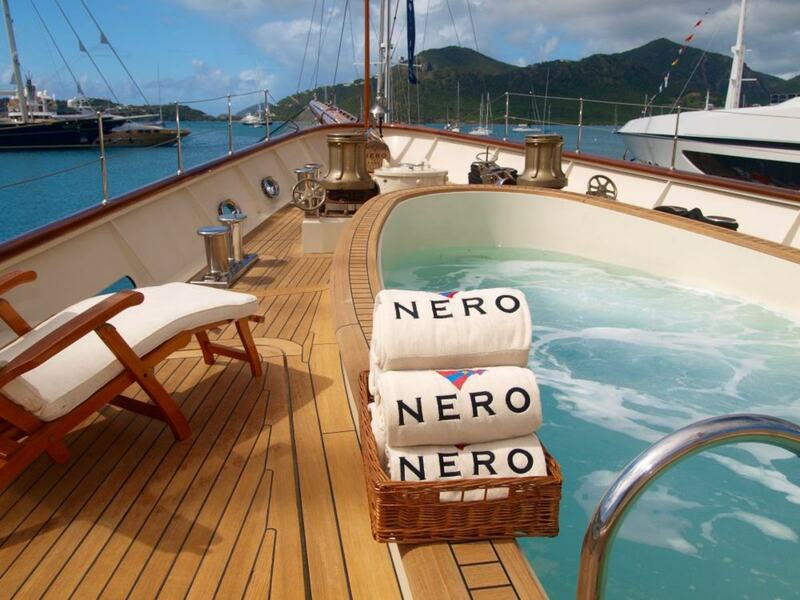 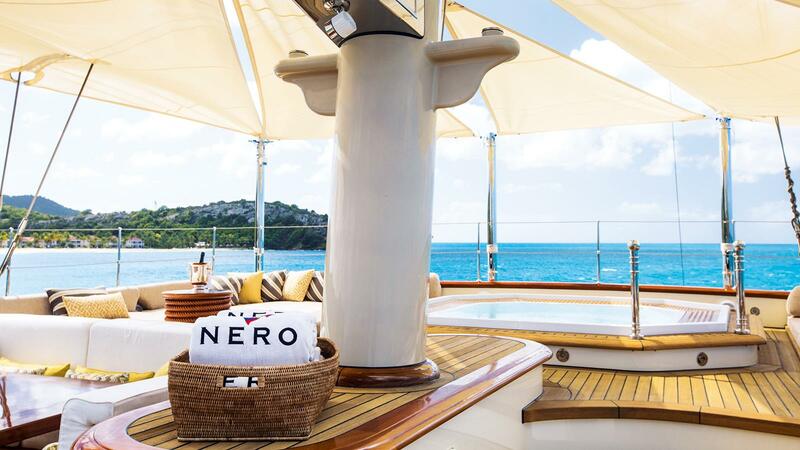 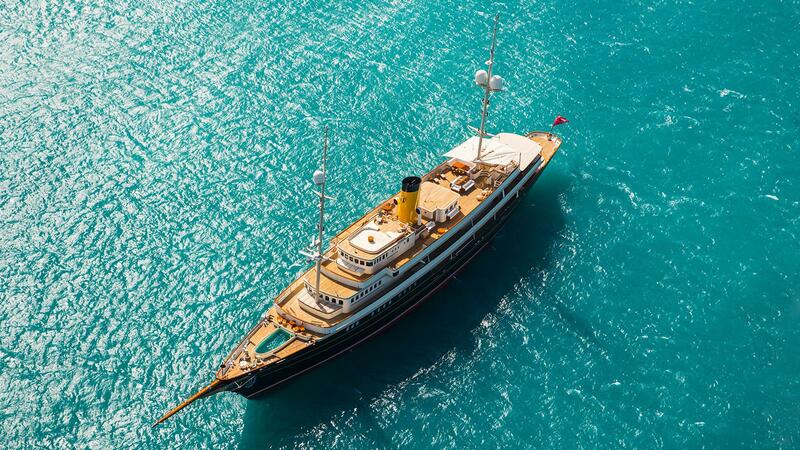 Nero superyacht´s exterior and interior are both designed by Neil Taylor and feature sleek lines and classic style to resemble J. Pierpont Morgan´s famous yacht Corsair. 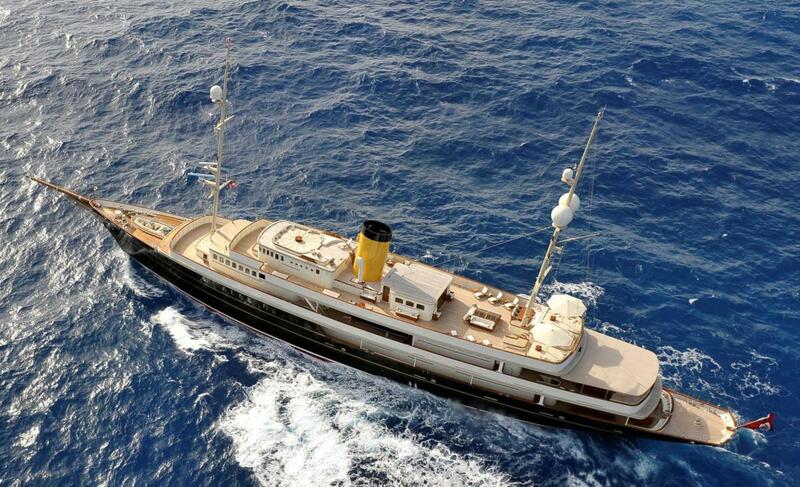 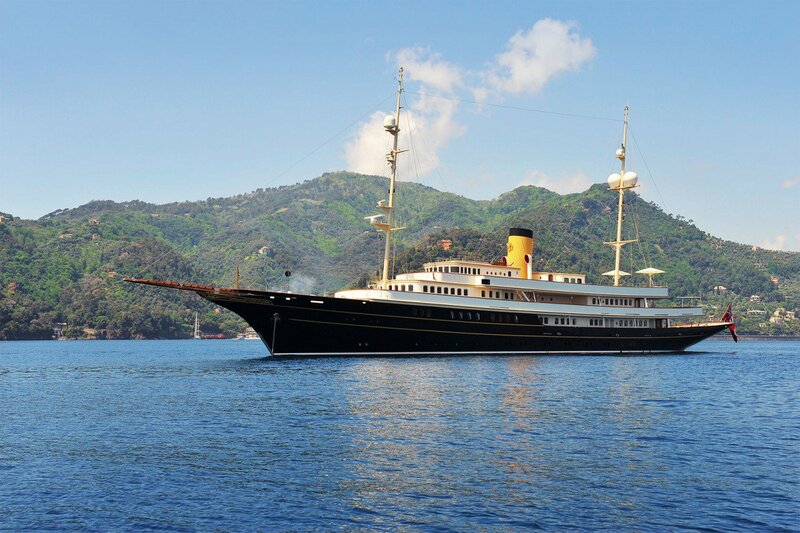 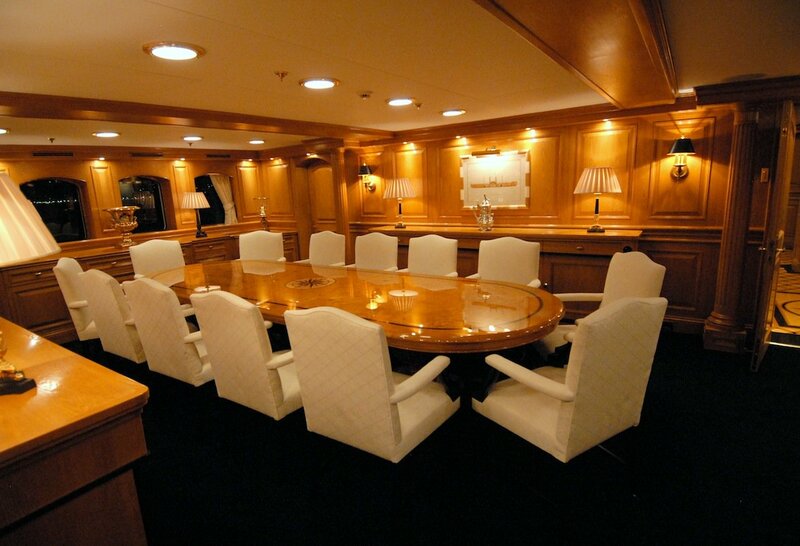 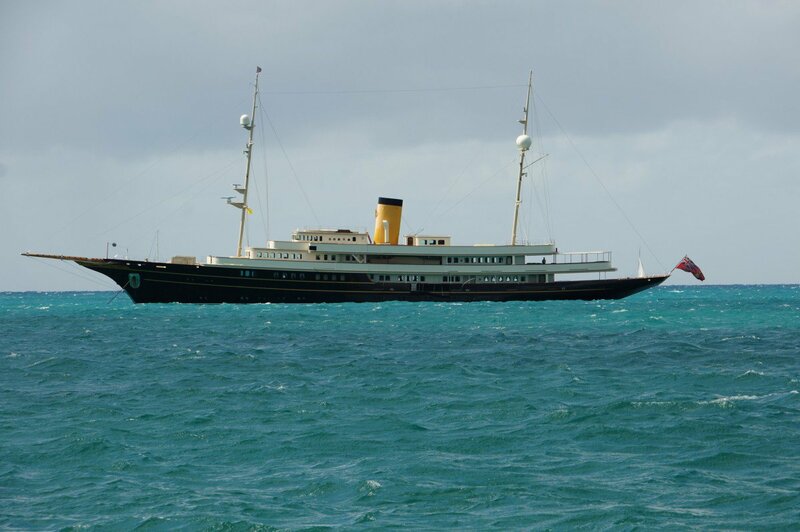 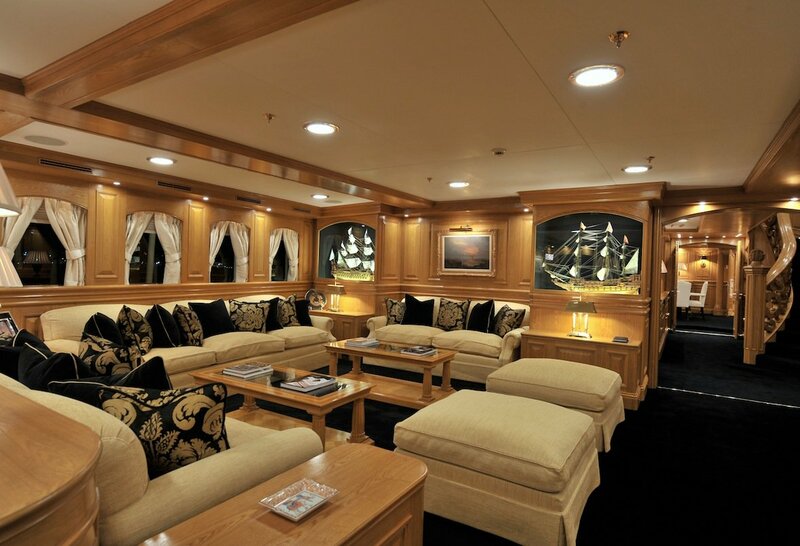 Accommodation onboard is offered for up to 12 guests in 7 cabins. 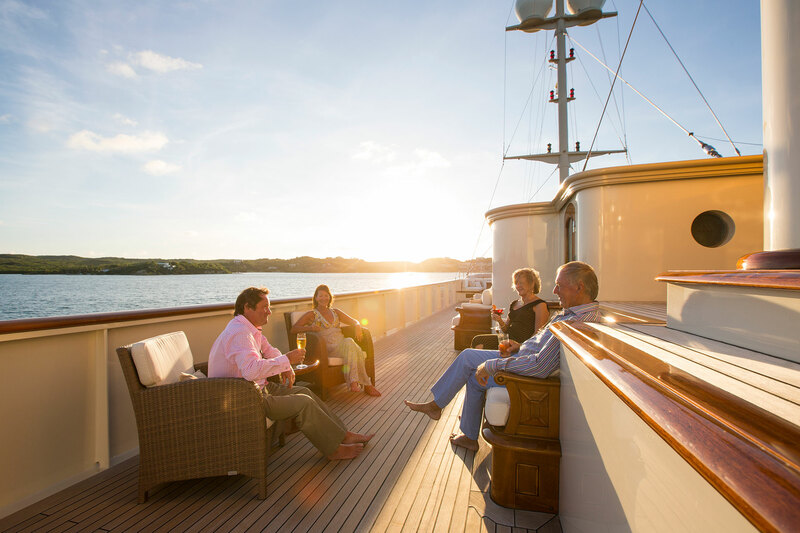 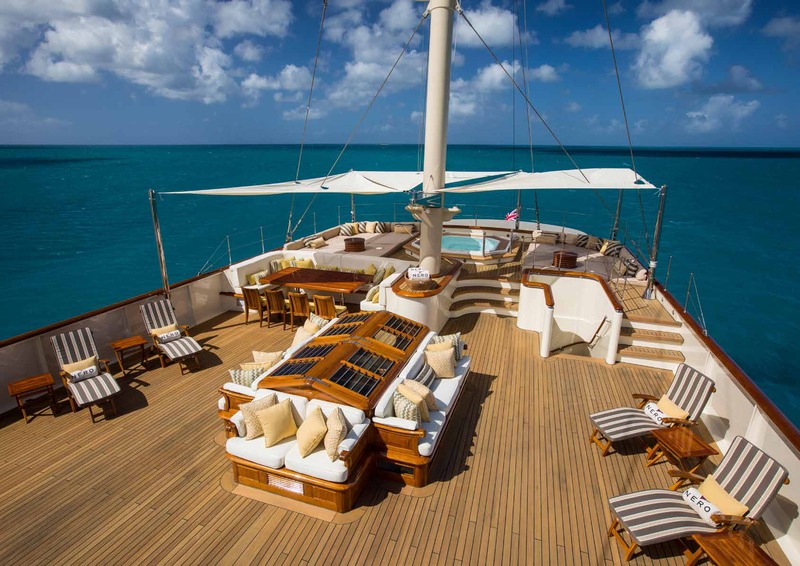 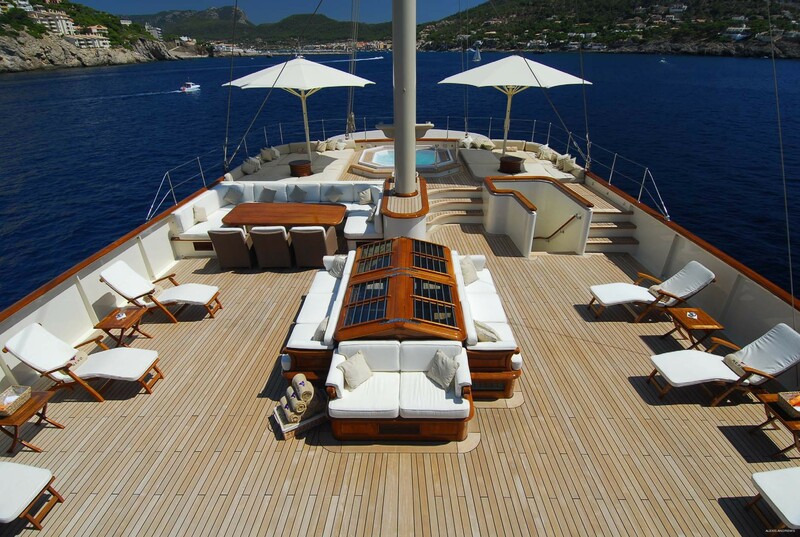 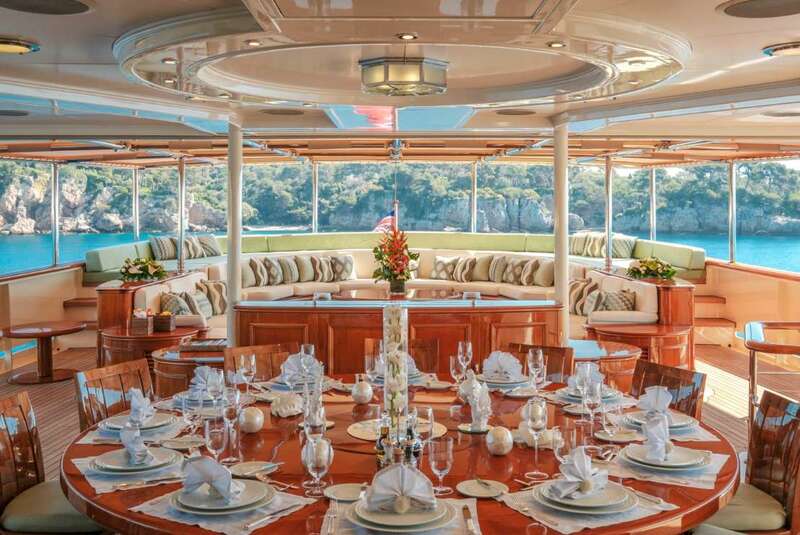 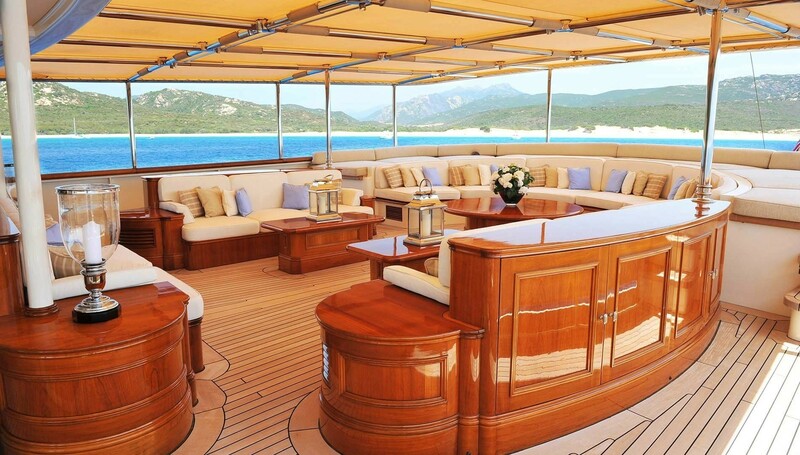 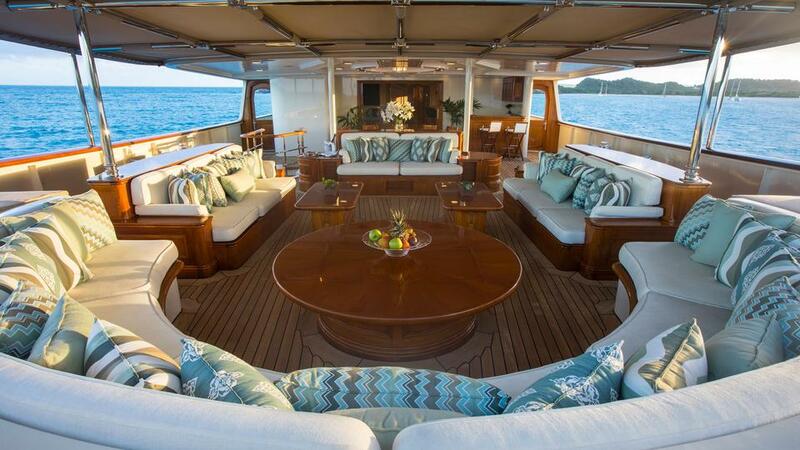 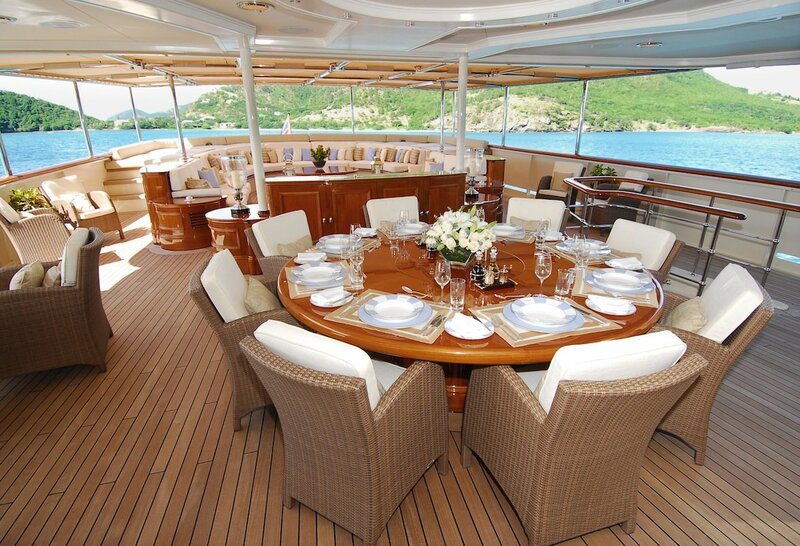 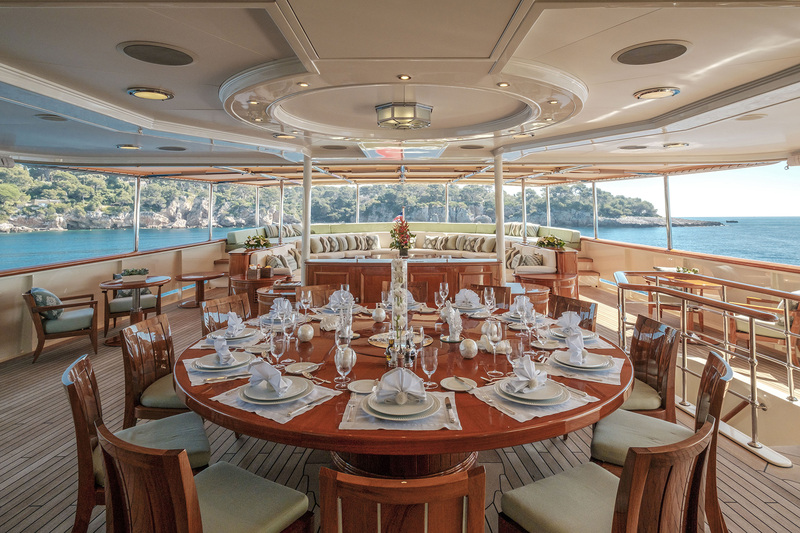 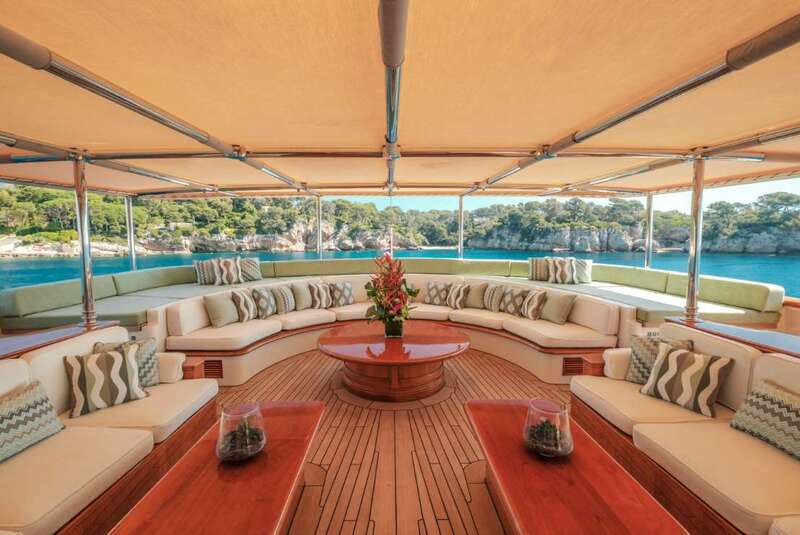 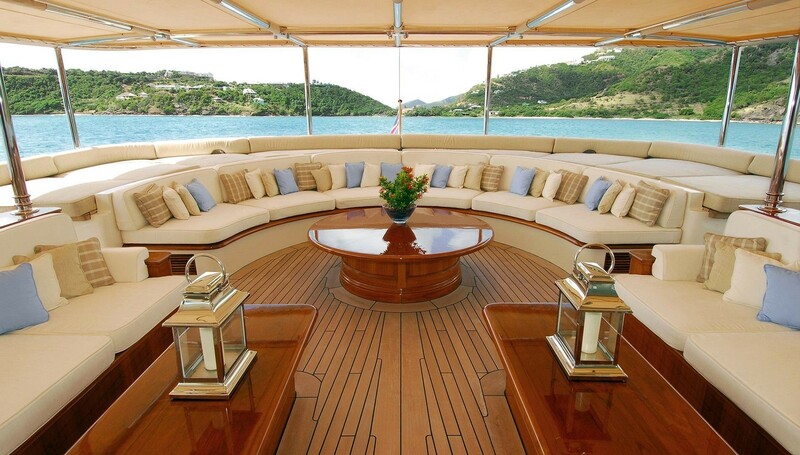 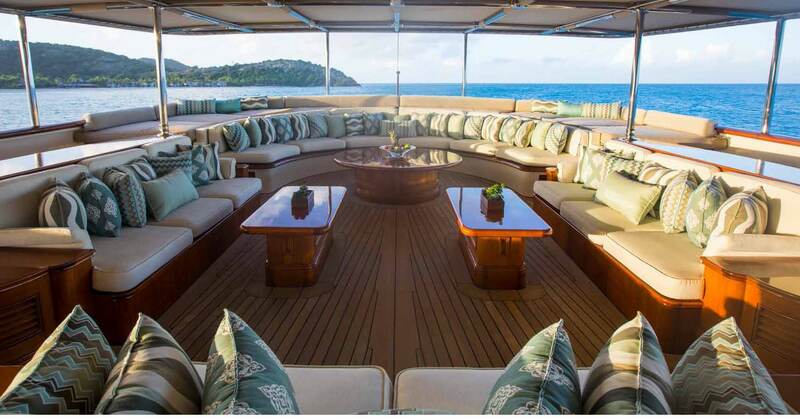 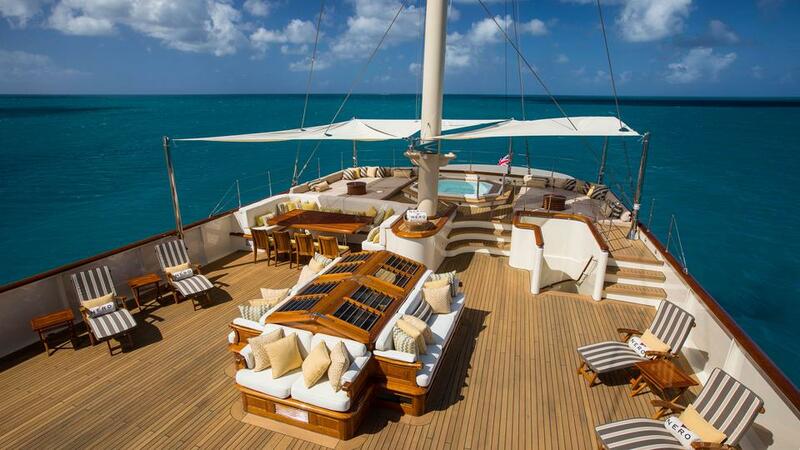 The main deck aft has a broad and elongated table perfect for celebrating special occasions with family and friends throughout the afternoon or at sunset. 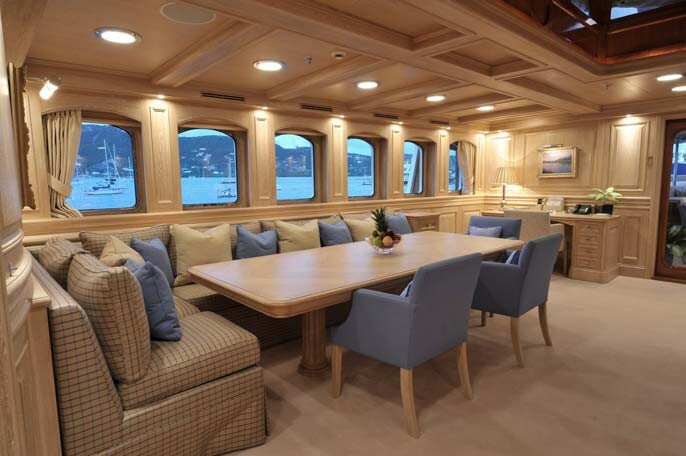 Along the stern, integrated seating ensures all guests can remain outside and savour the air and the ambiance of the destination. 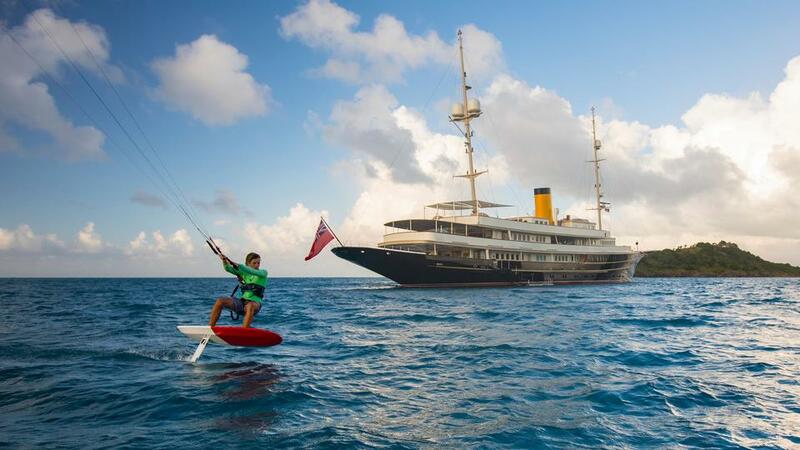 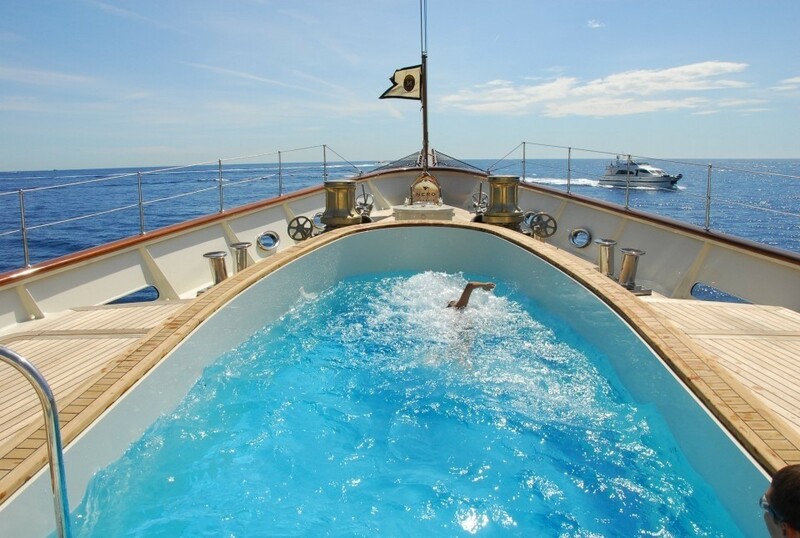 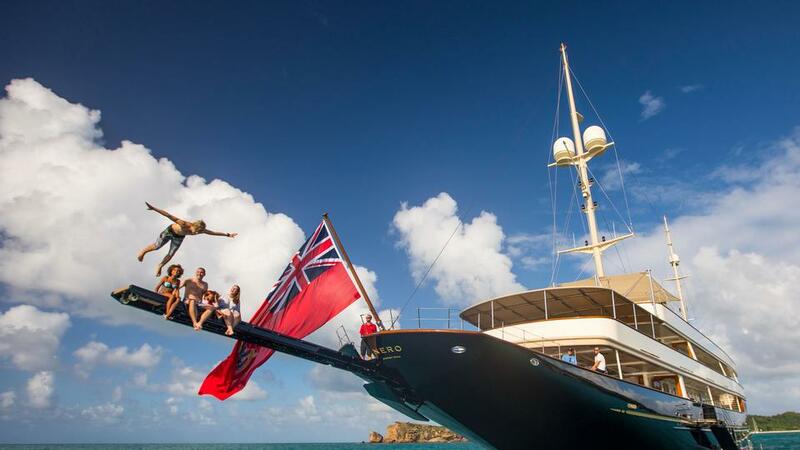 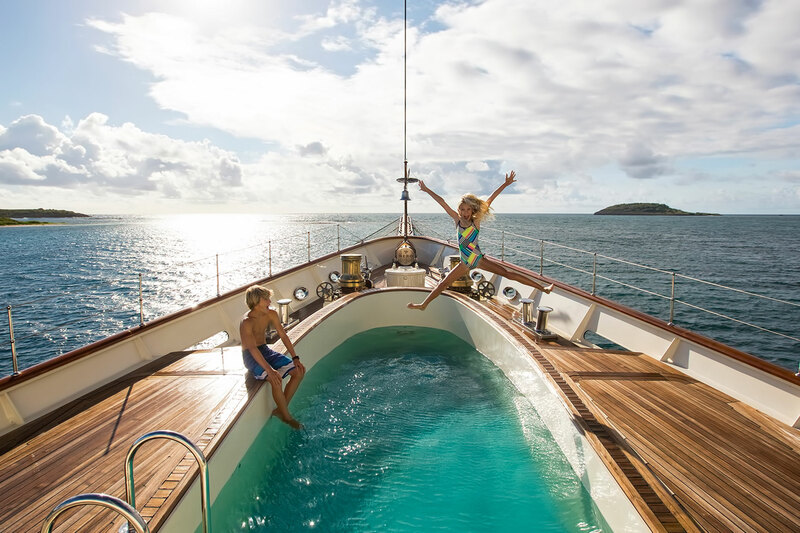 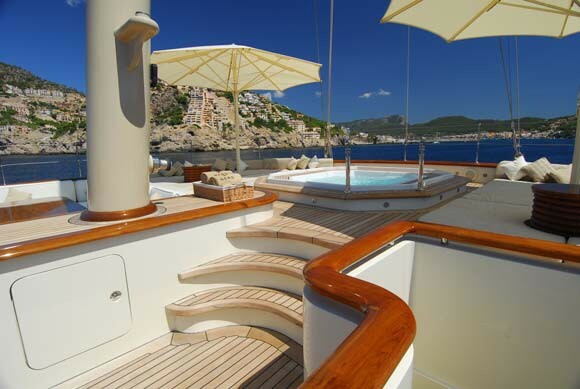 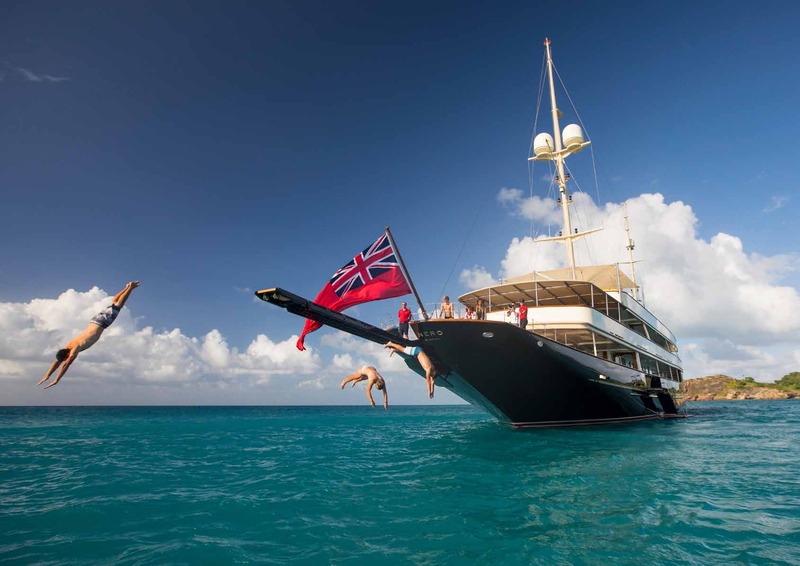 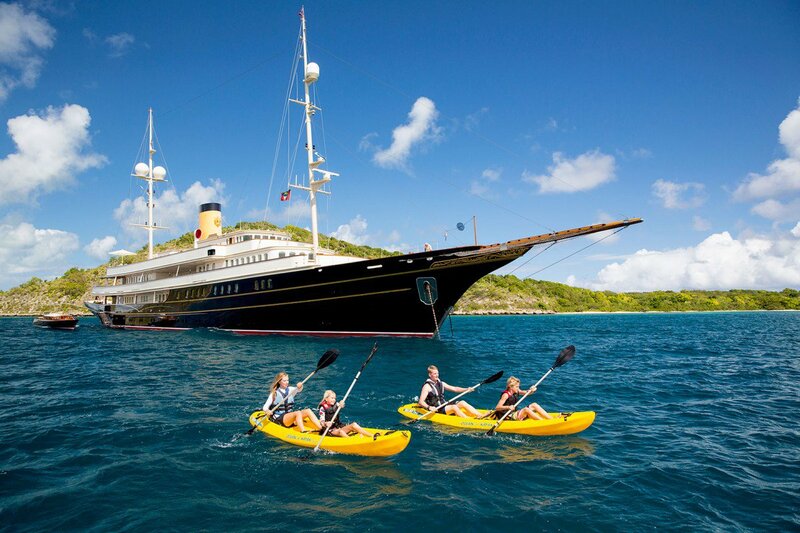 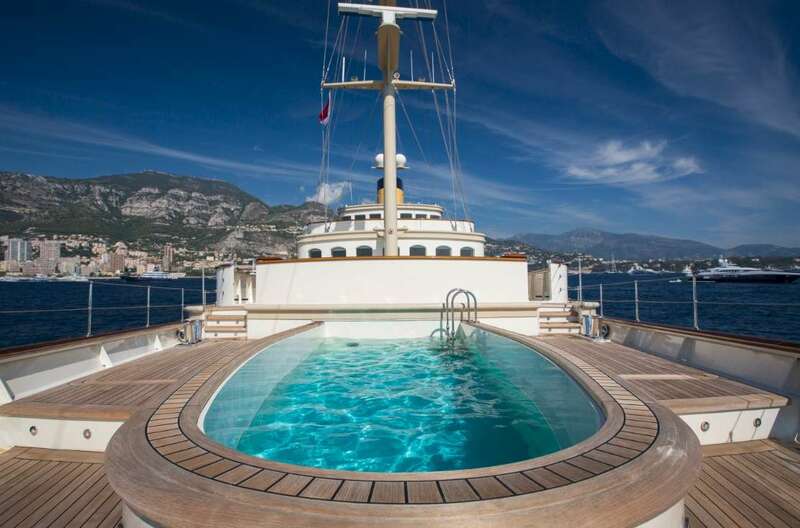 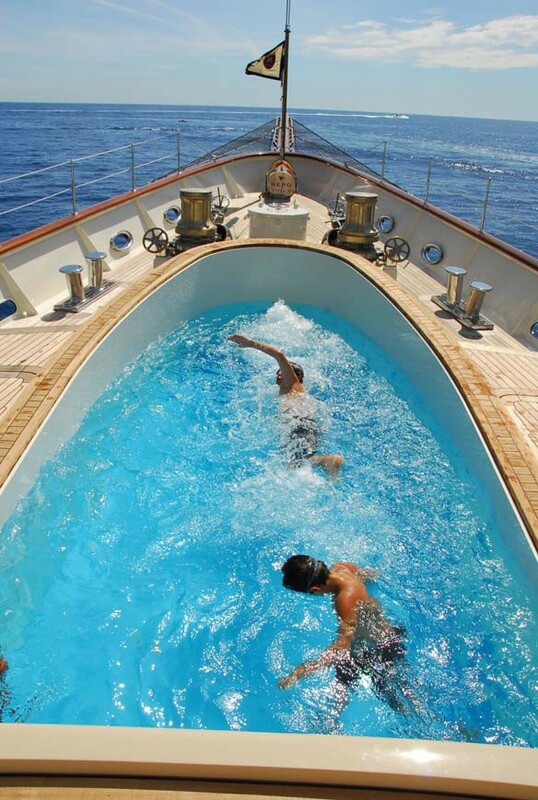 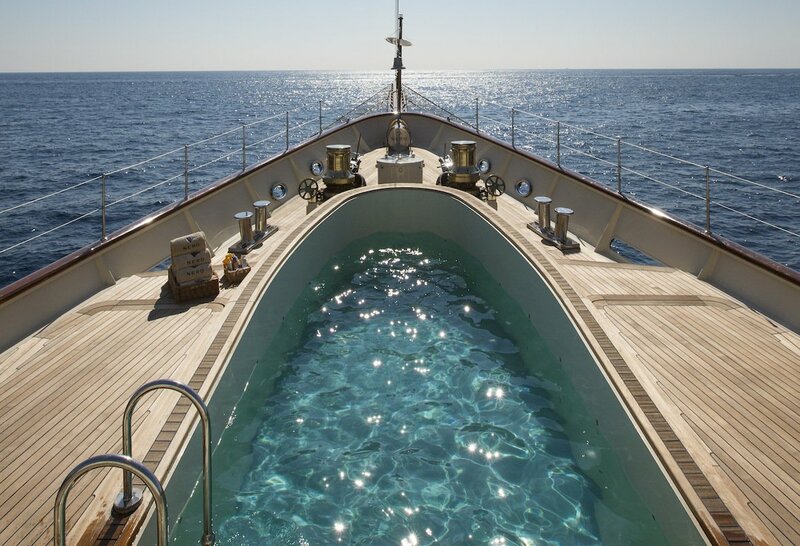 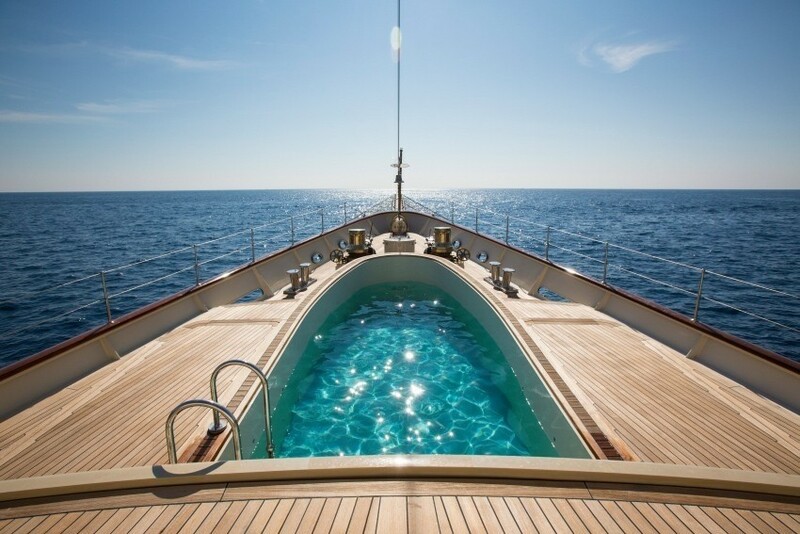 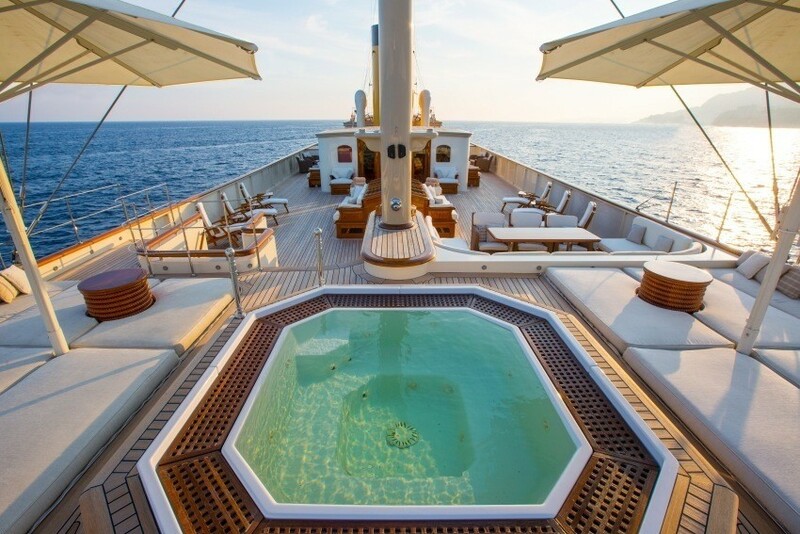 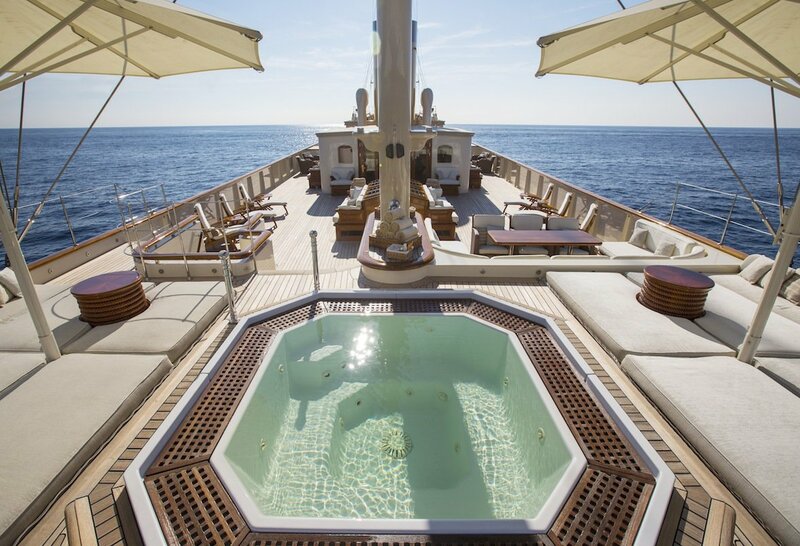 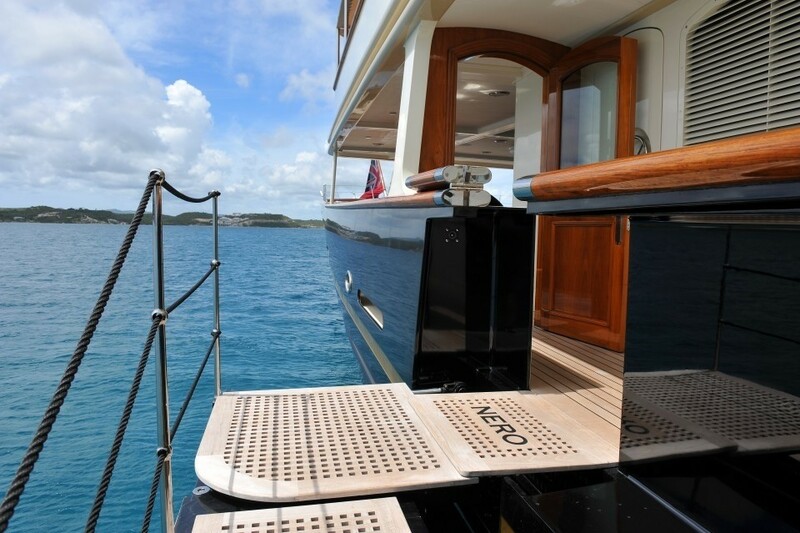 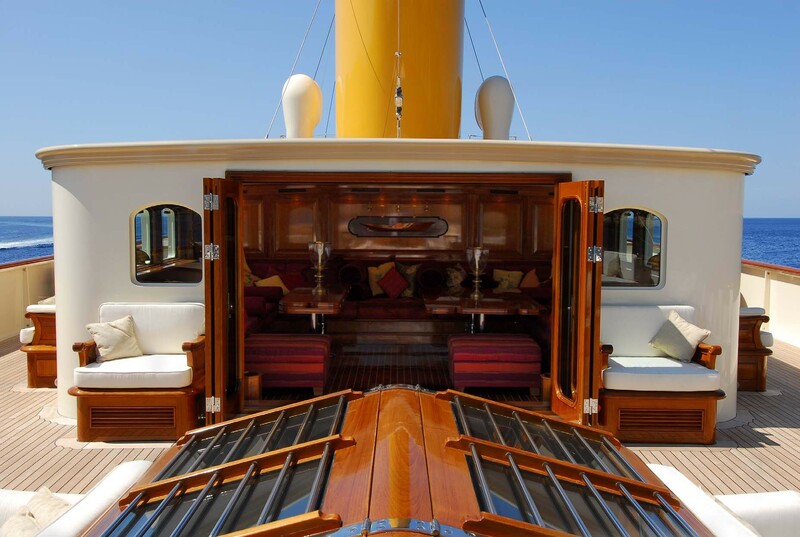 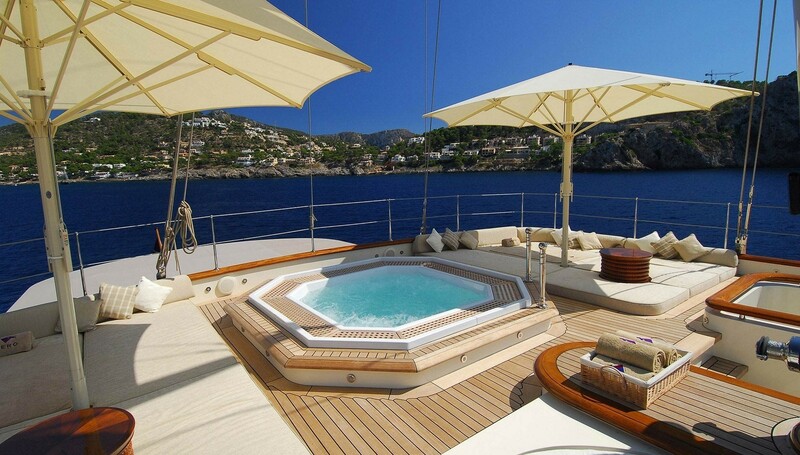 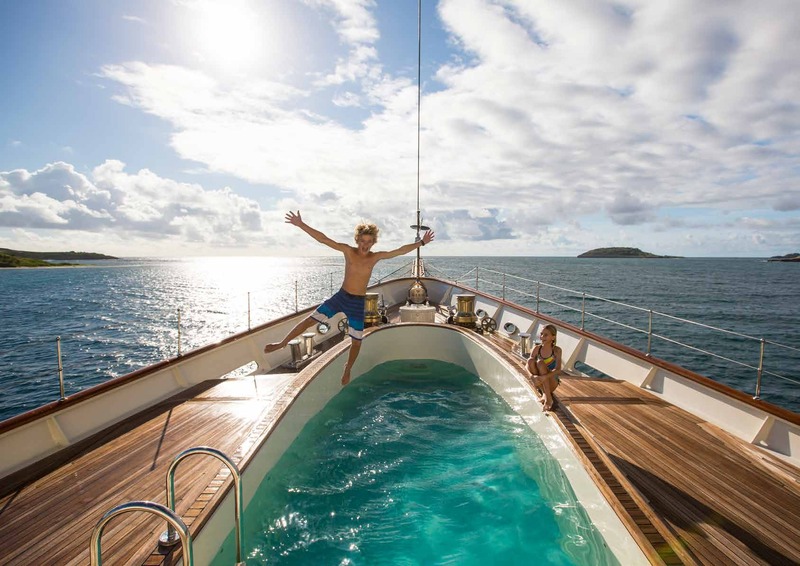 The upper deck bow has a large swimming pool with a ladder for ease of access in and out of the water. 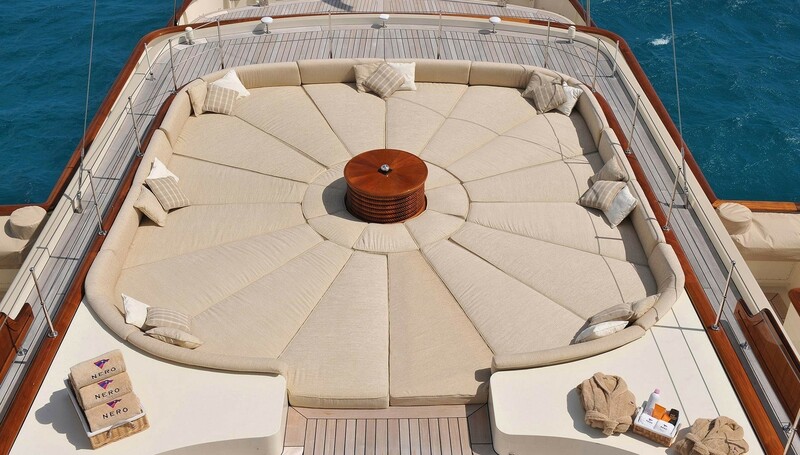 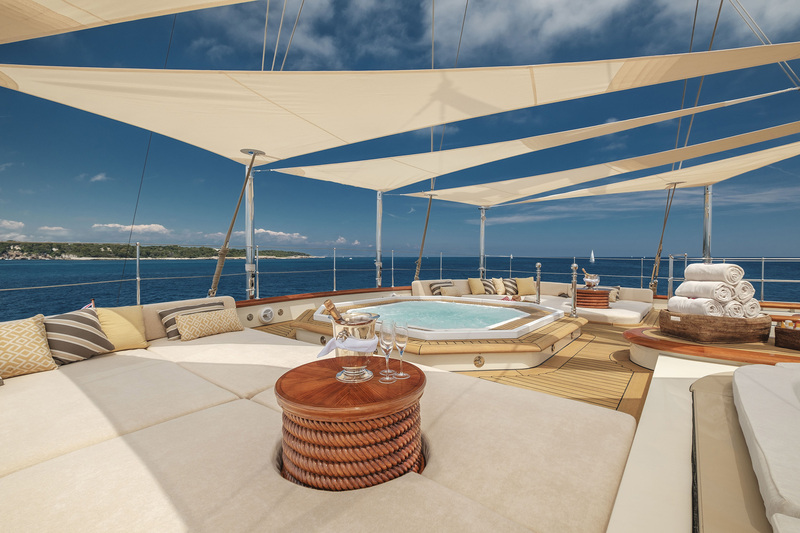 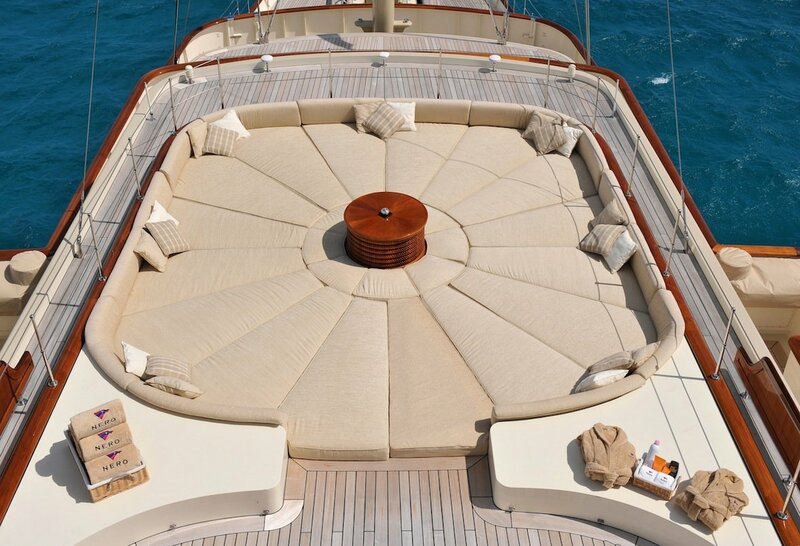 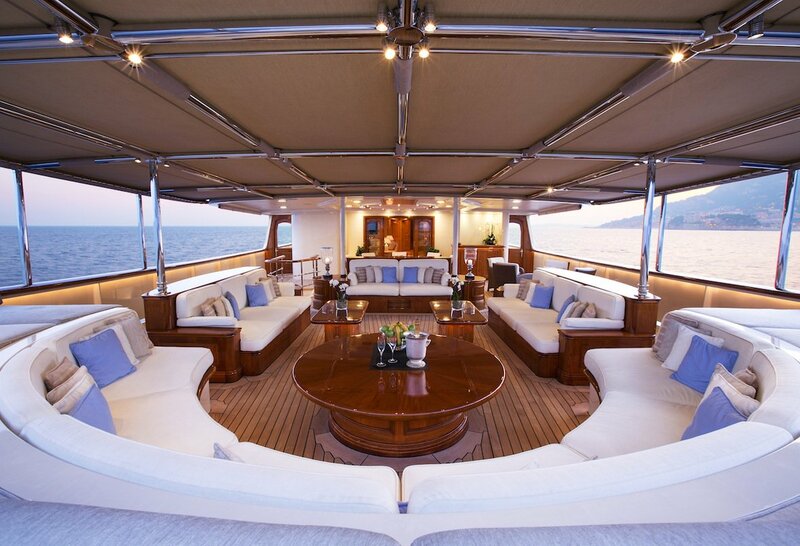 To the aft, the canopy-covered deck has a circular alfresco dining table to seat up to eight guests and armchairs, sun pads and sofas create an alfresco lounge to provide a place to begin the morning with group coffee or to unwind after dining with a drink from the discreet outdoor bar. 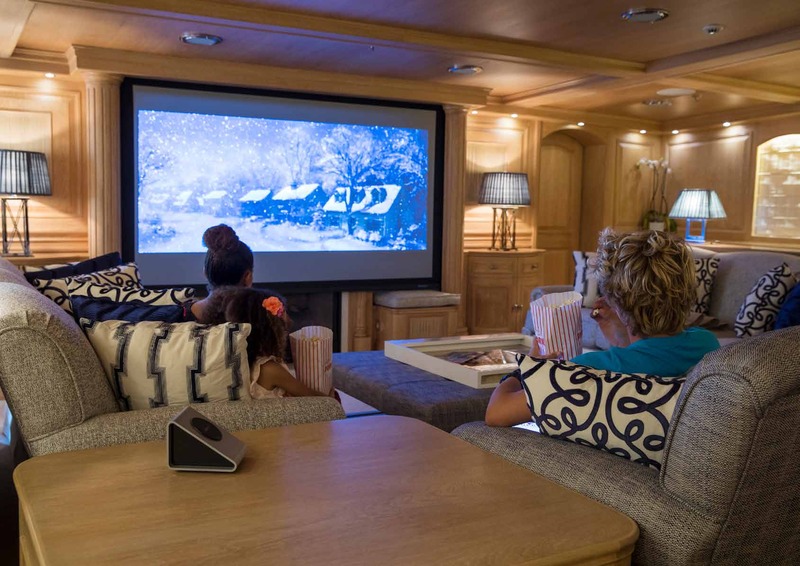 At night, the area can be converted into an outdoor cinema. The sundeck is laid out with plenty of sun loungers and seating to suit large dockside events. 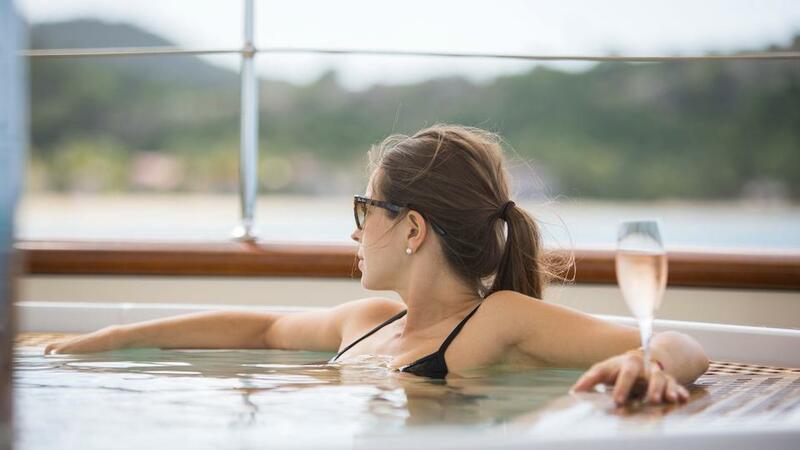 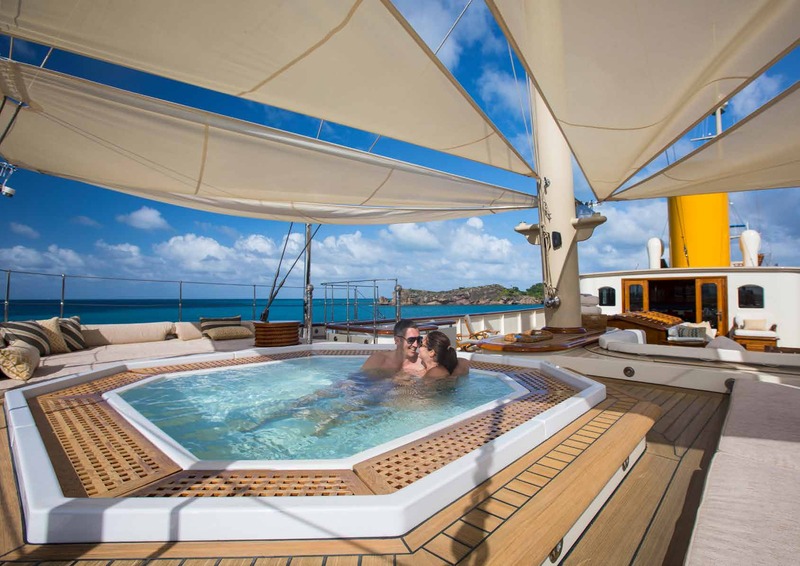 The views are unparalleled anywhere on board and guests can dine alfresco while enjoying this advantage before taking a dip in the generously proportioned aft Jacuzzi. 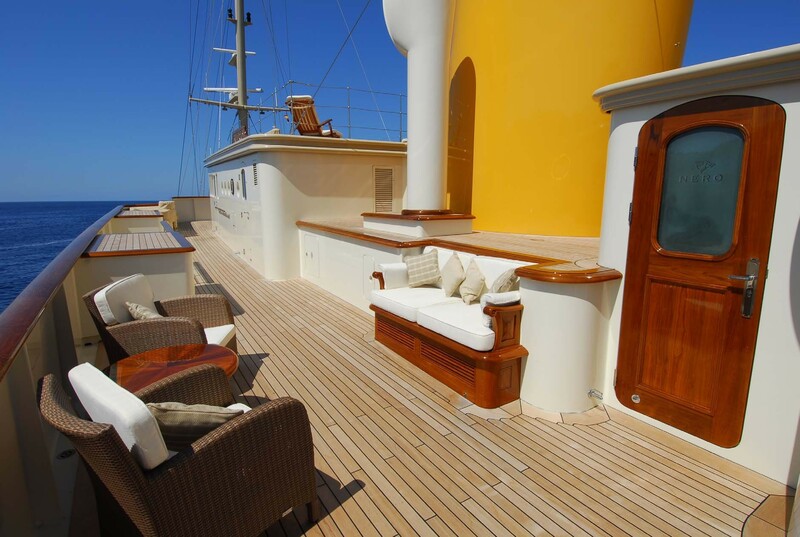 A ladder leads to the upper sundeck level fr a quiet spot in the sun to spread out on the massive sunpad section or lie back into the sun loungers. 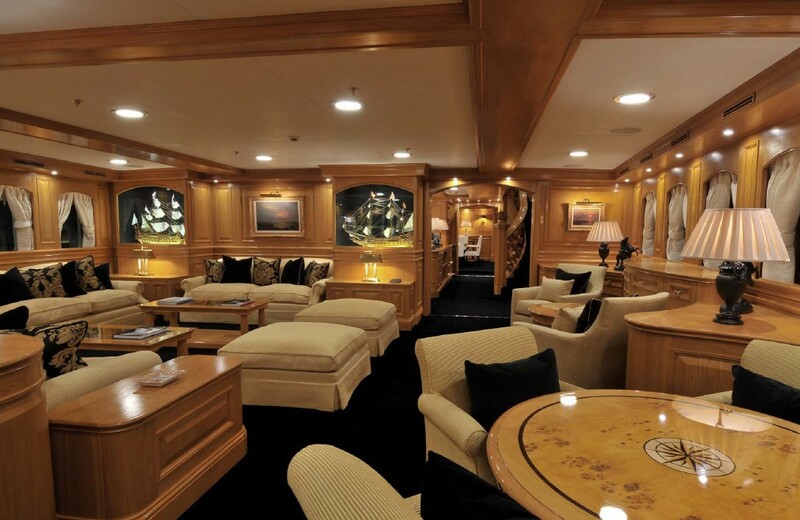 The central section of the lower deck is dedicated to guest accommodation and includes two lounges that can be converted into additional cabins as required. 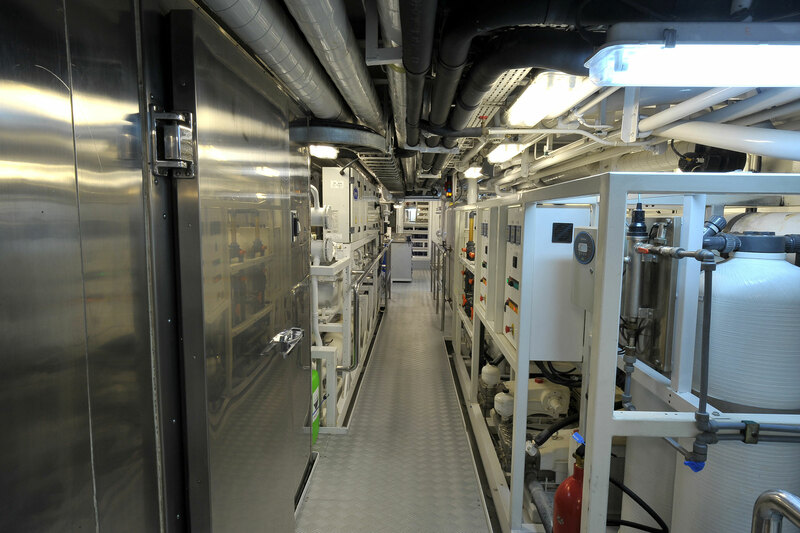 The bow area contains the crew quarters, and a set of stairs leads down to the tank deck where the laundry is located. 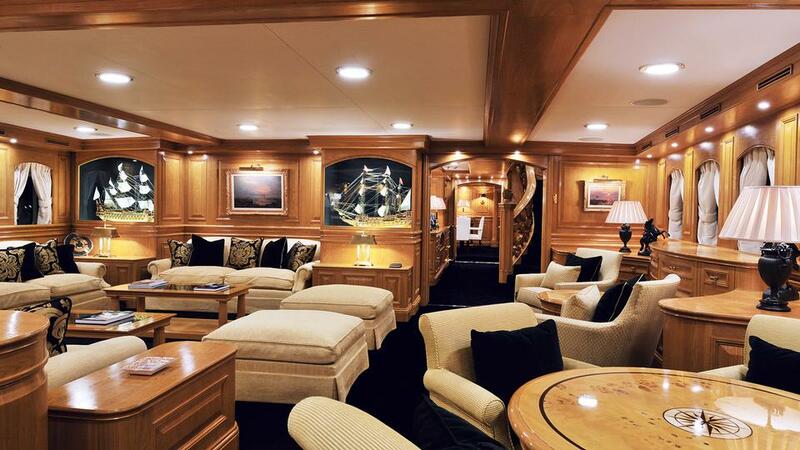 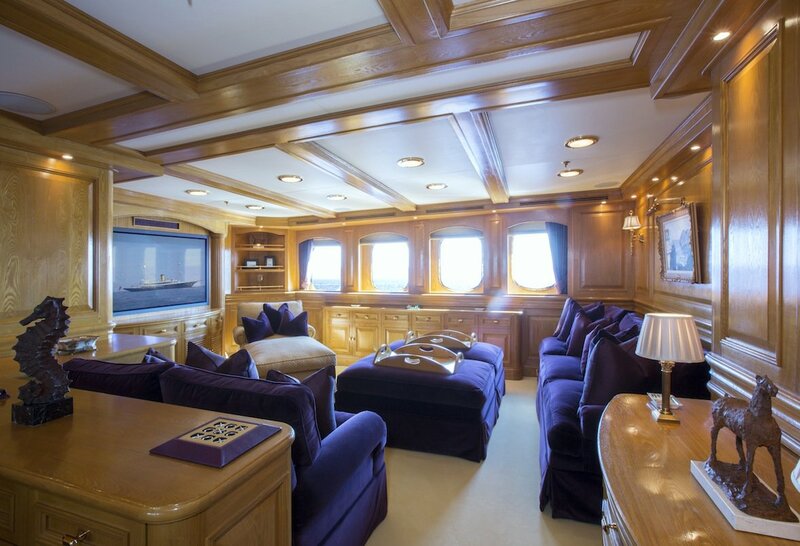 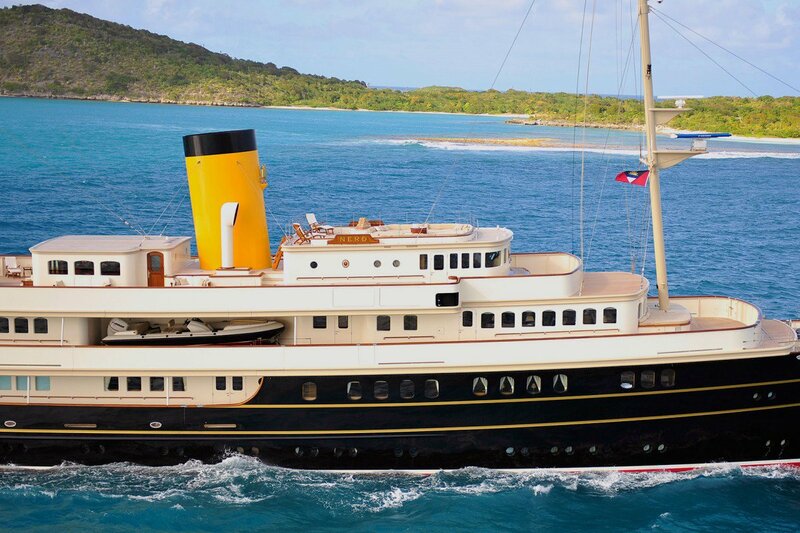 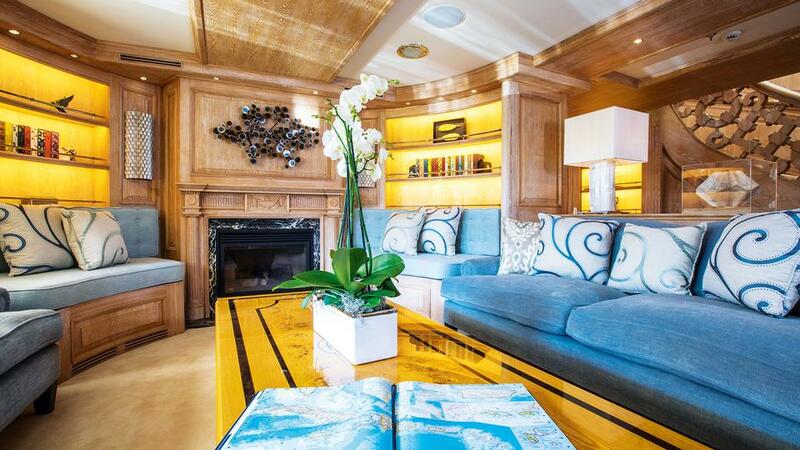 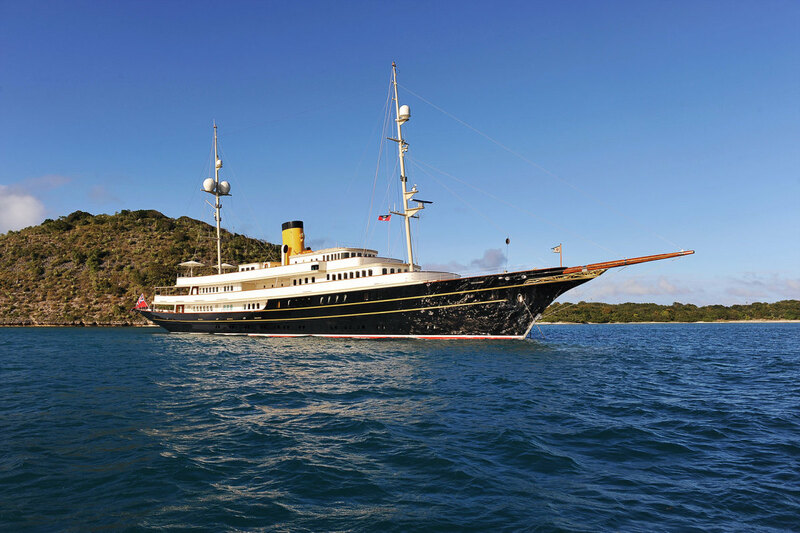 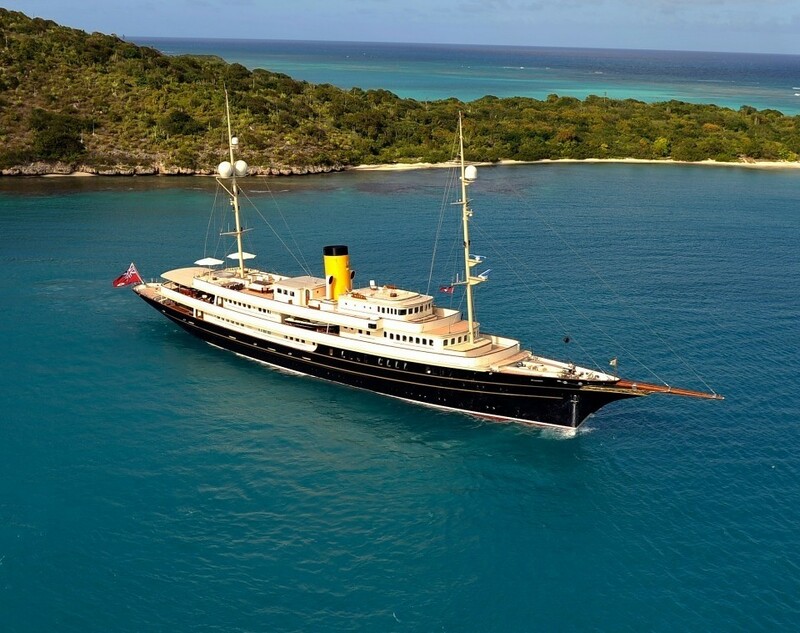 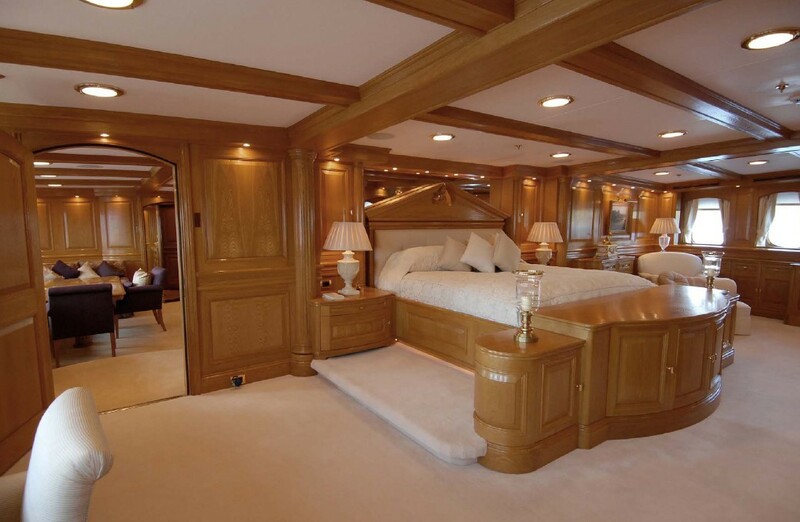 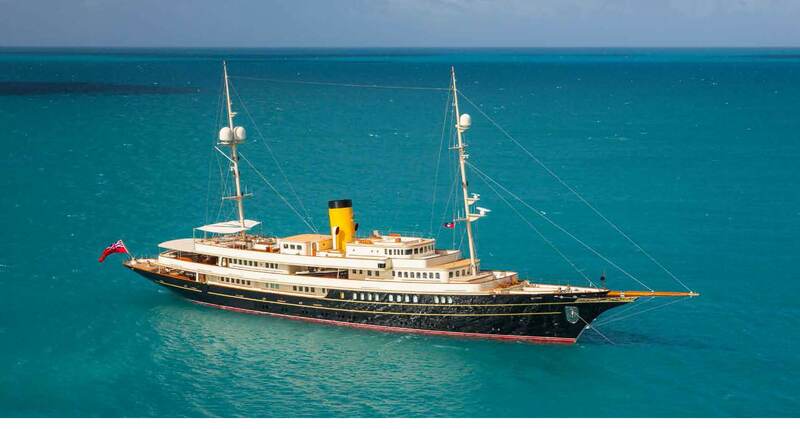 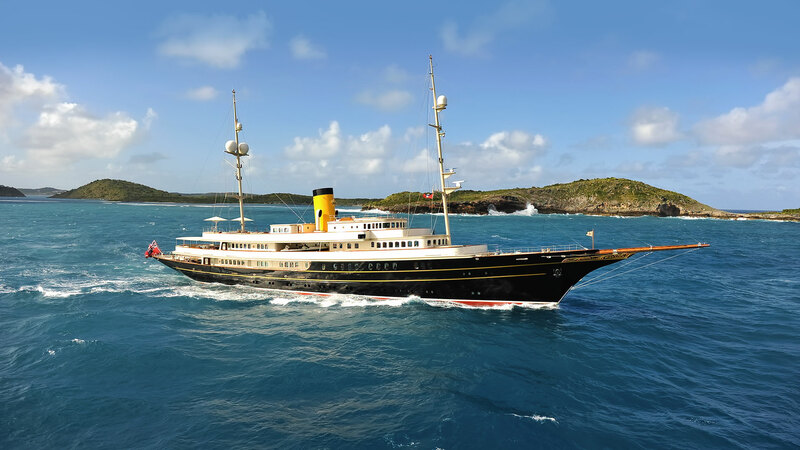 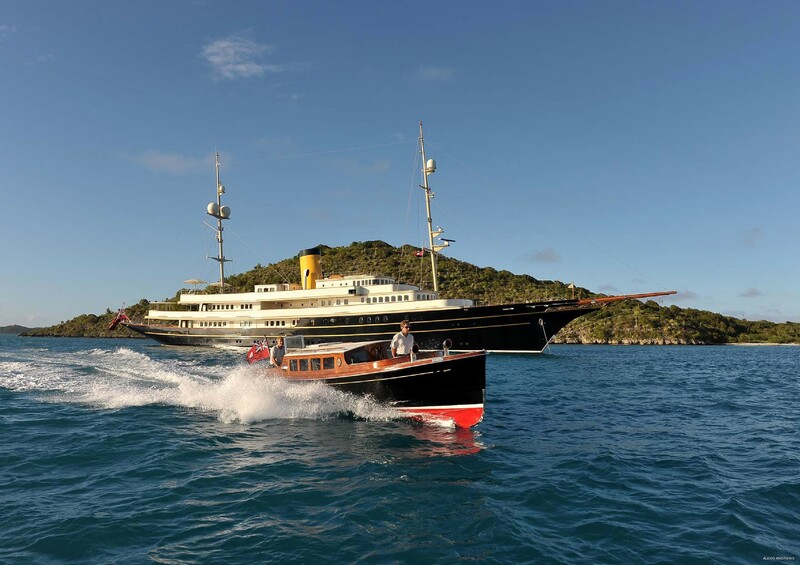 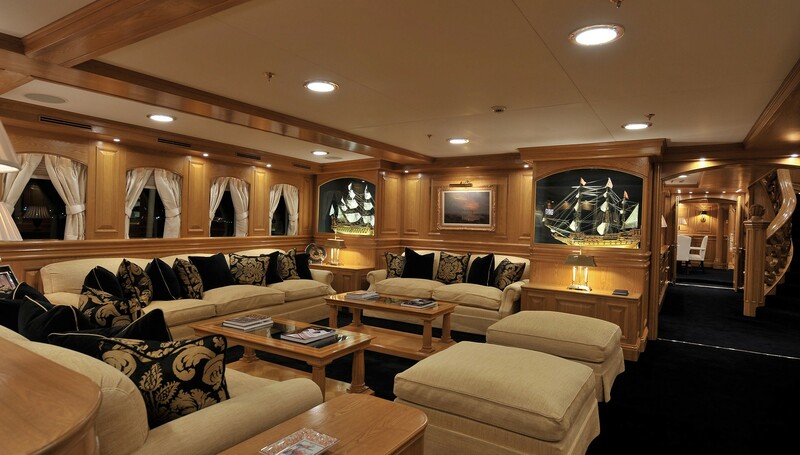 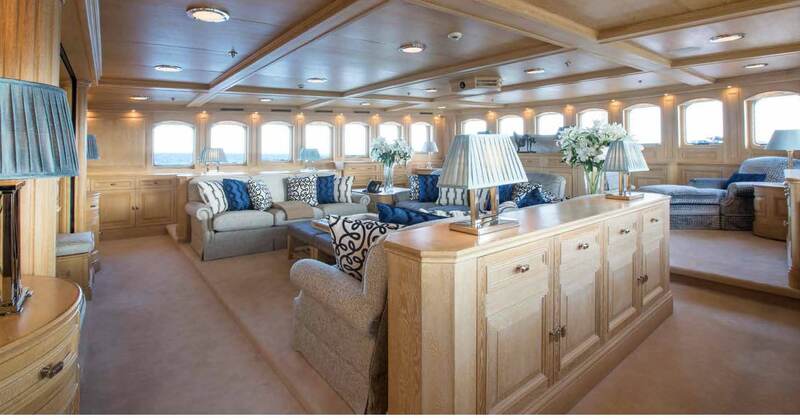 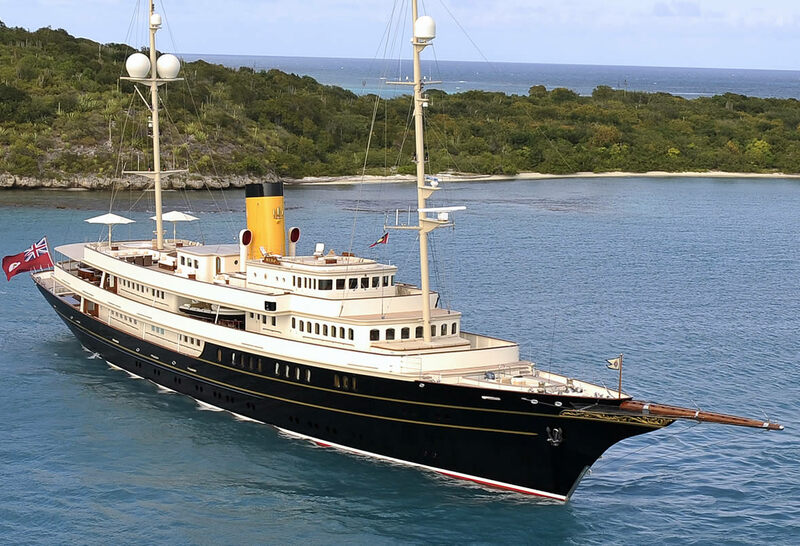 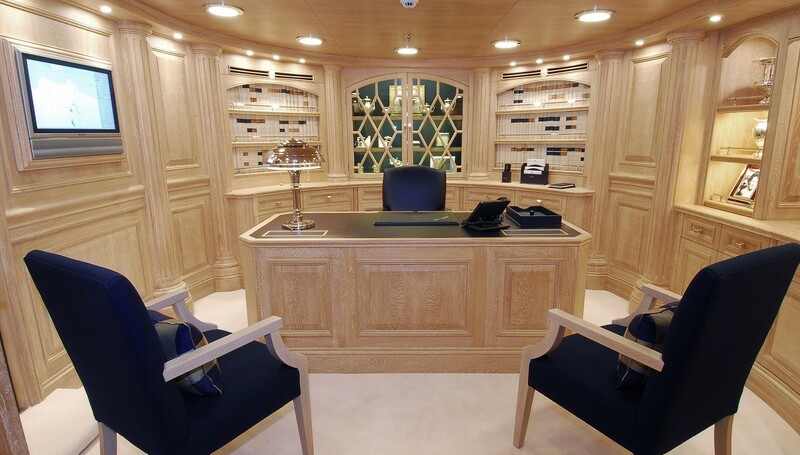 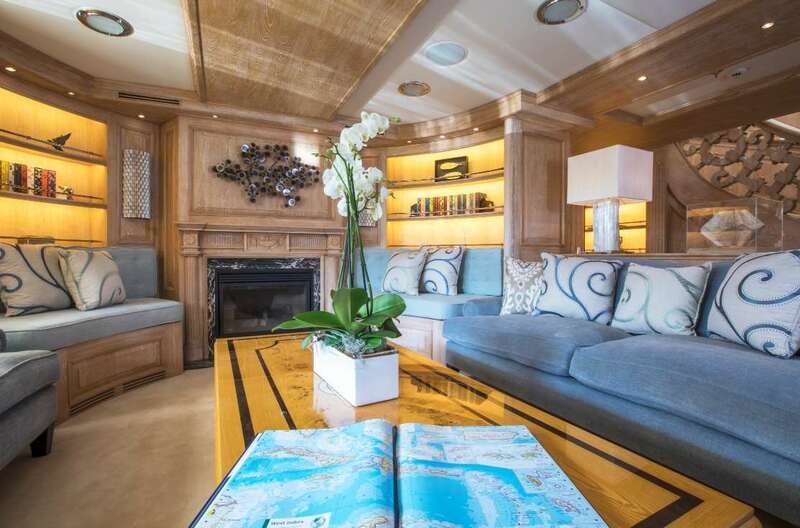 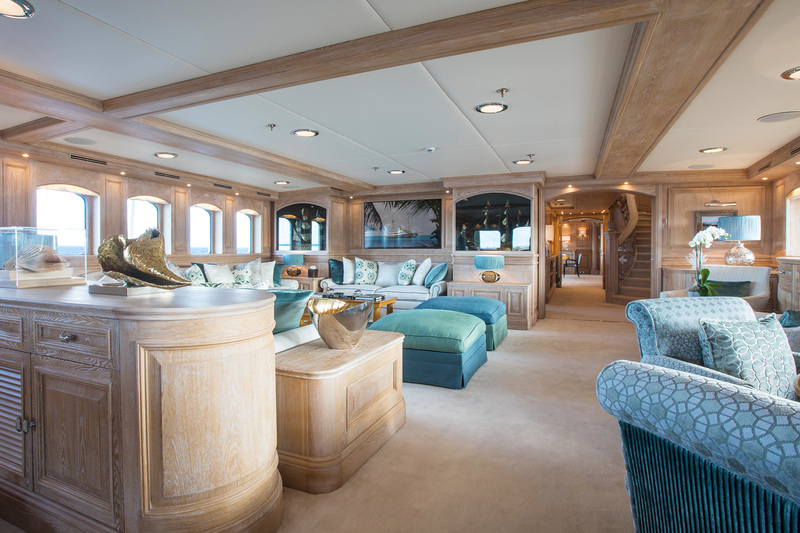 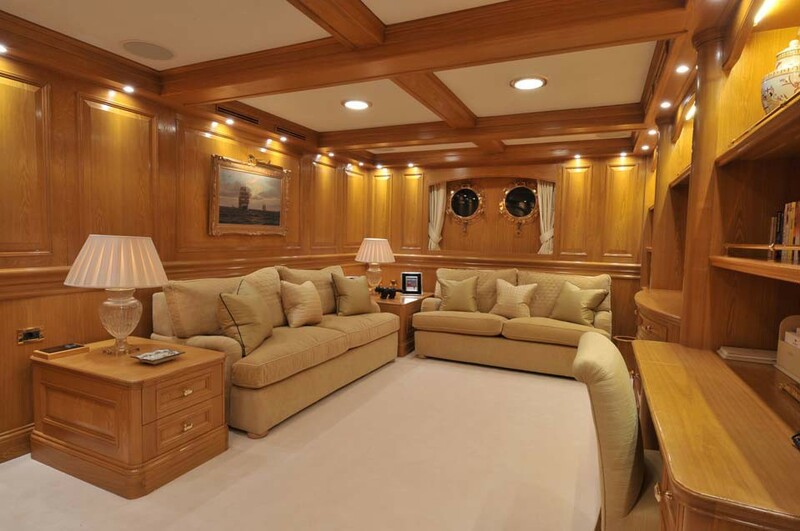 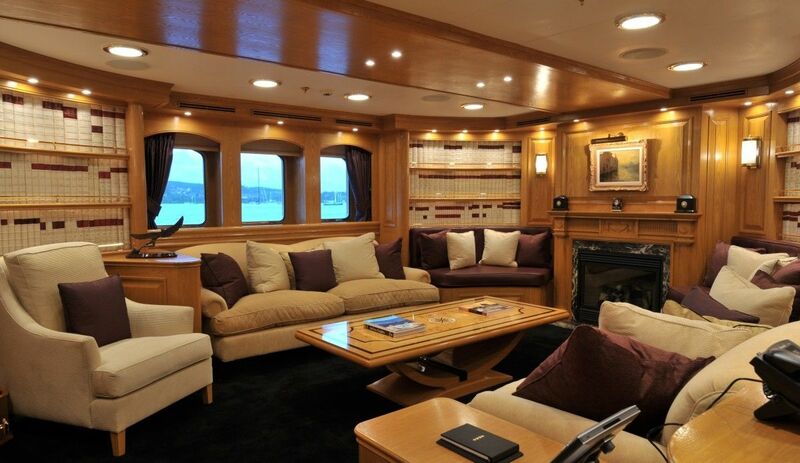 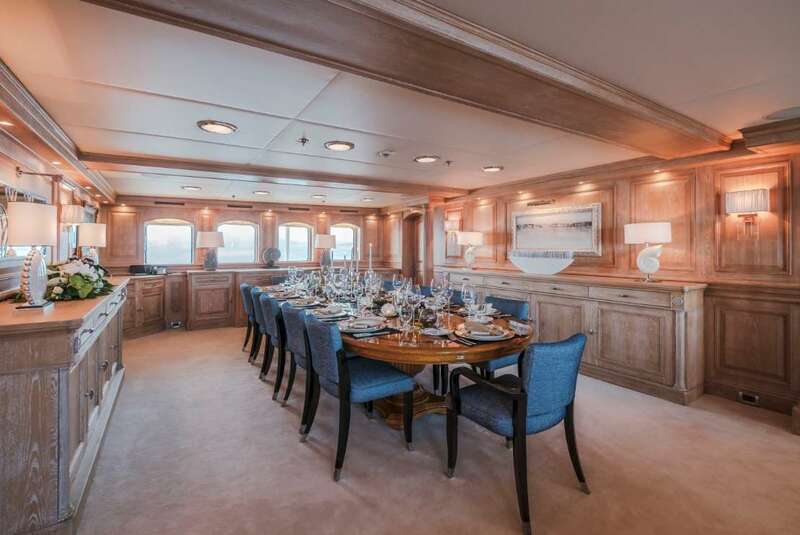 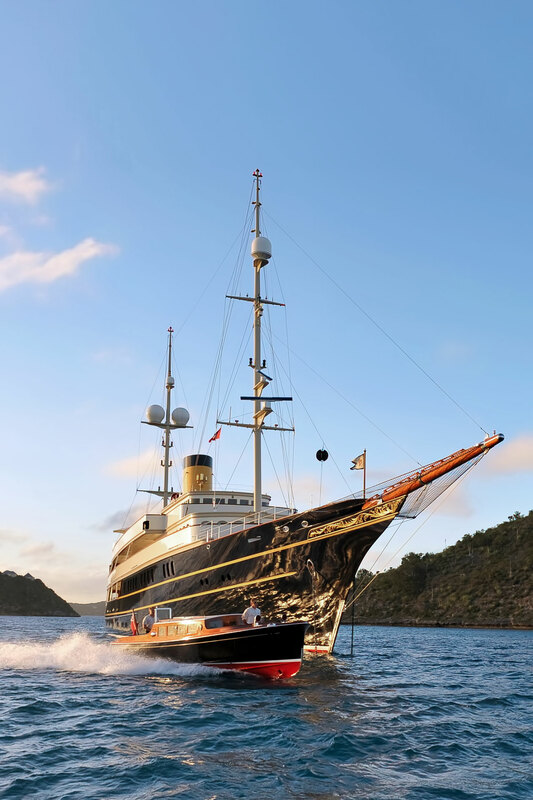 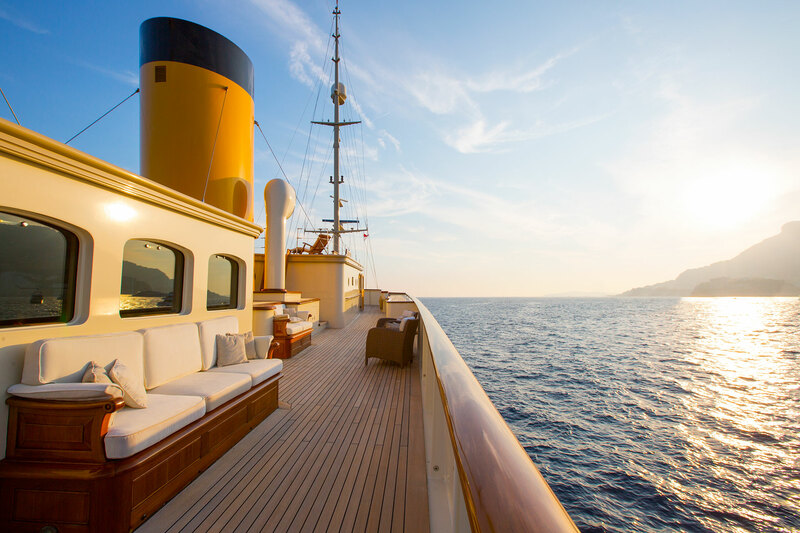 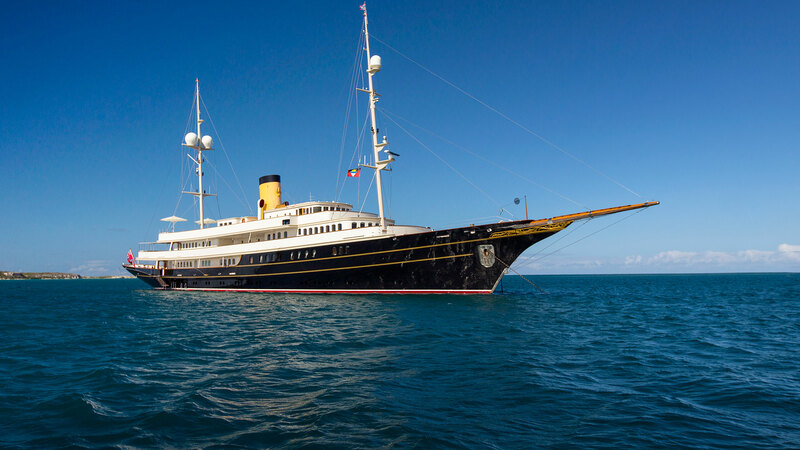 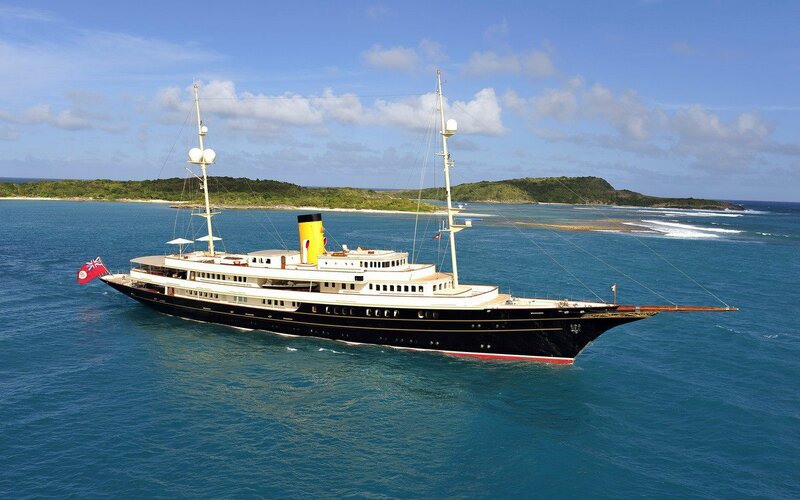 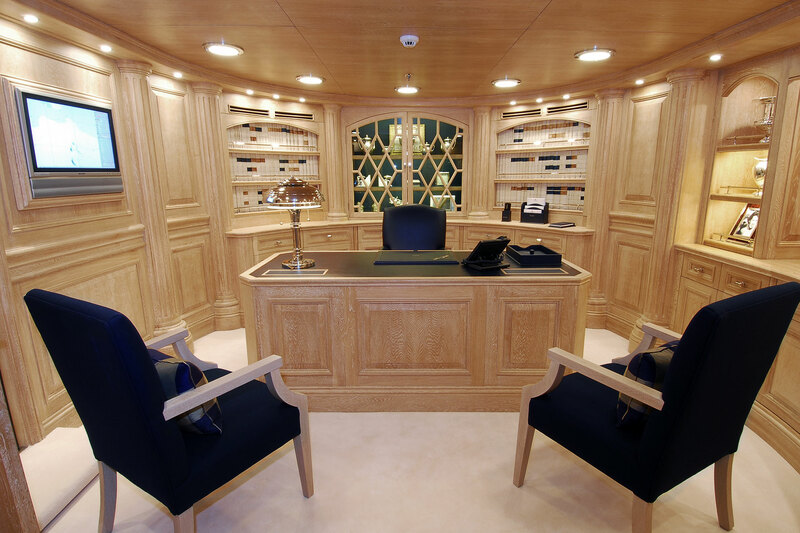 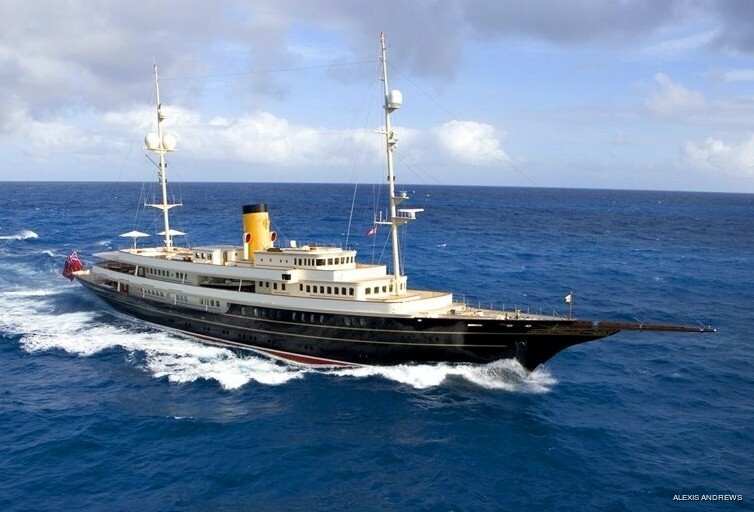 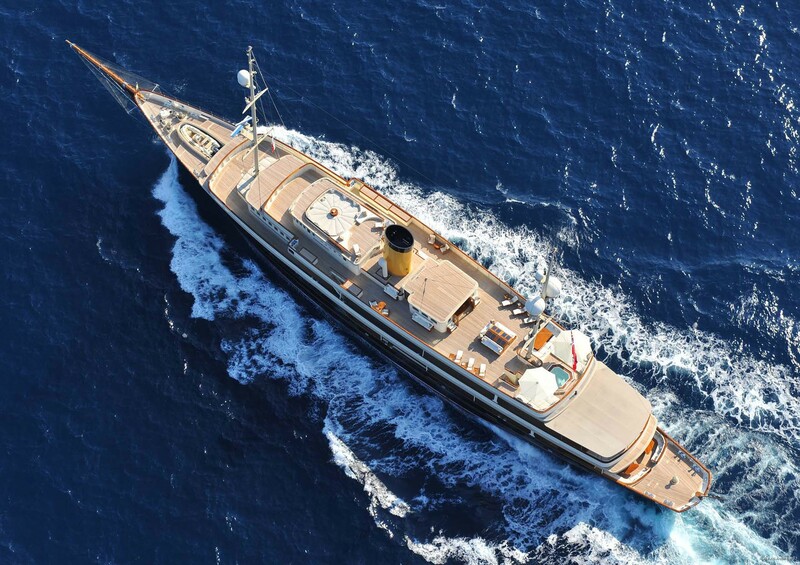 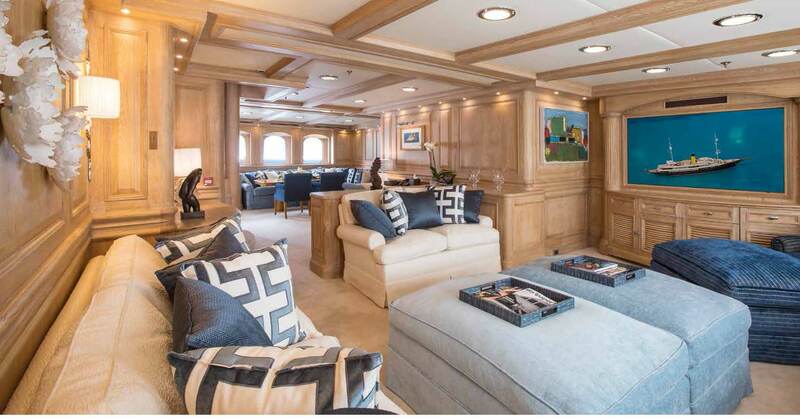 The main deck bow has additional crew accommodation, and the impressive Master suite is located behind, featuring his and her bathrooms forward and a private lounge and study behind with a staircase that connects up to the forward upper deck. 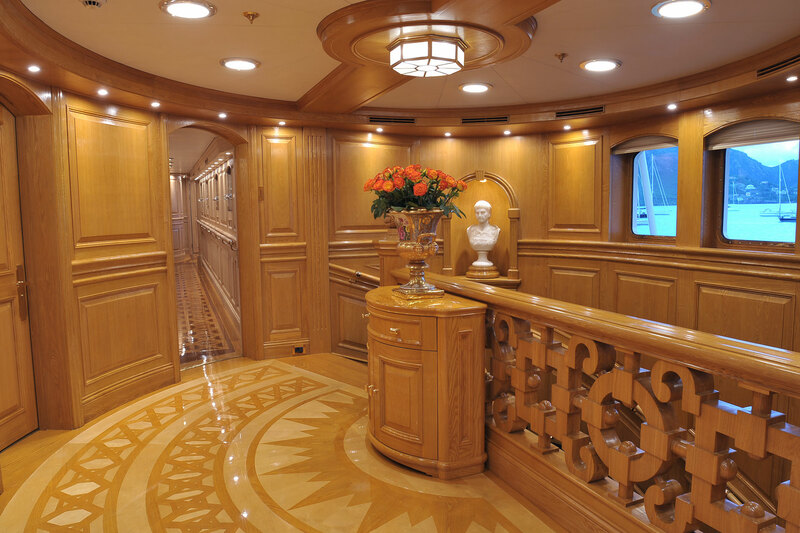 The main foyer separates the Master suite from the formal dining area, which contains seating for up to 14 guests in warm and welcoming interiors where classic columns, lampshades, and traditional art add to the ambiance. 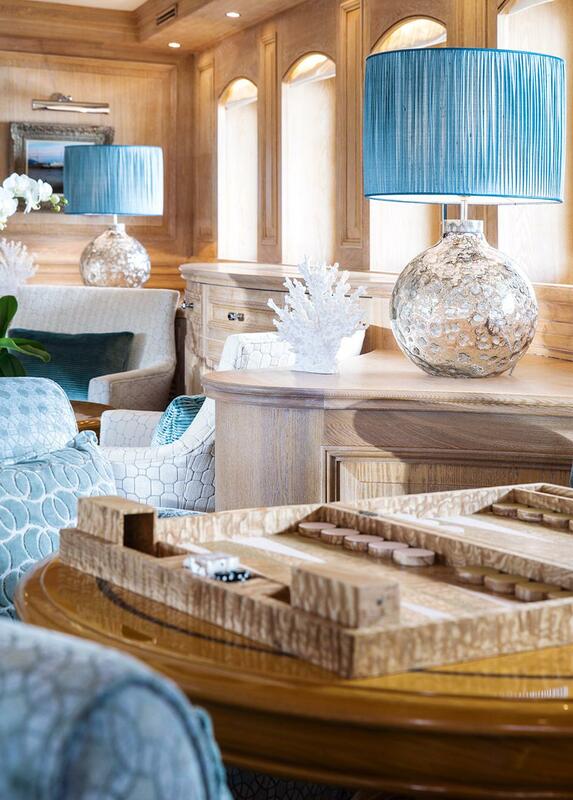 After a delicious meal, guests can retreat to the beautifully styled library located between the dining room and the main salon. 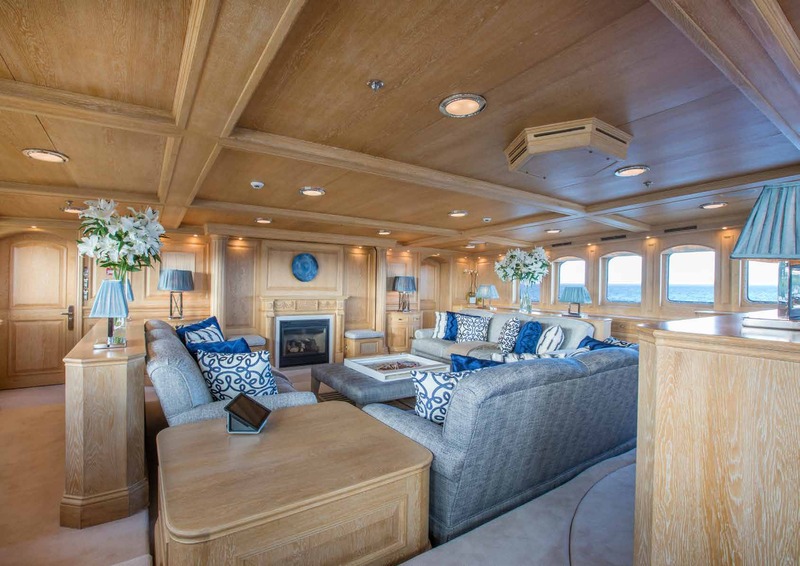 The charming environment is ideal for conversation or rest, and pale oak paneling is offset by plush pale blue sofas and white pillows around a large coffee table in front of the fireplace. 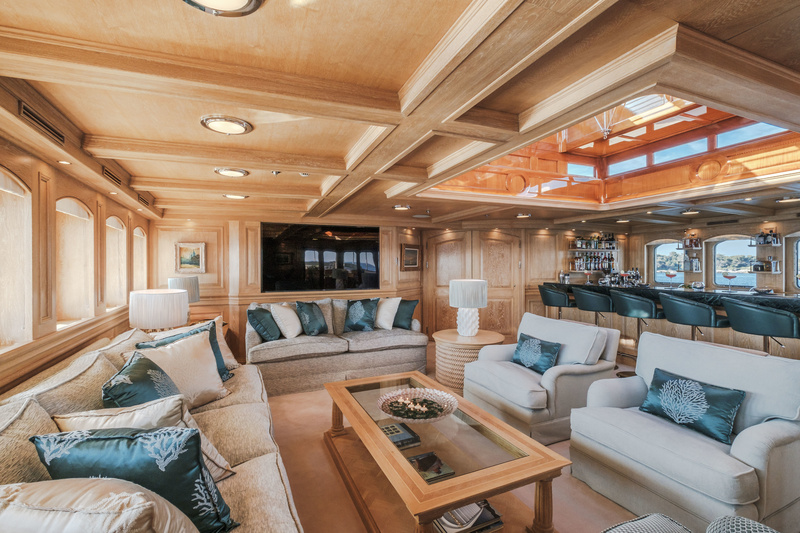 The main salon is designed for group gatherings, and the port side is the hub, offering three over-padded sofas and foot rests where guests can chat and admire the views through the classically styled arching windows. 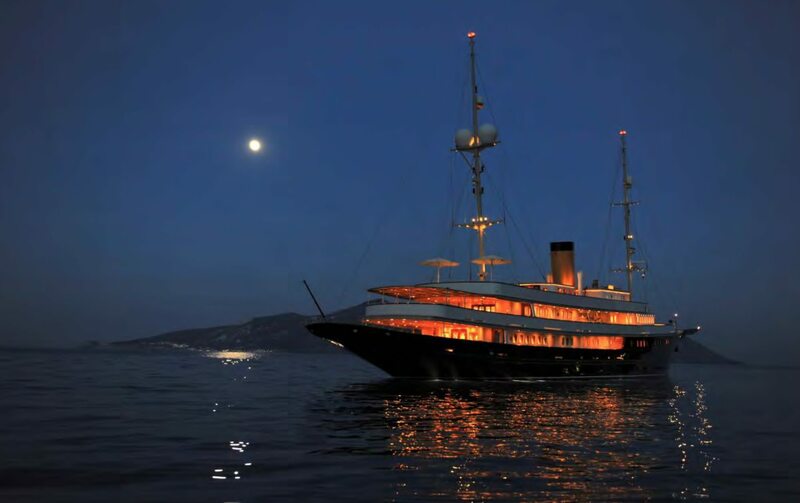 Two model ships will intrigue adults and children alike, and in the evening the display cases light up to draw the eye. 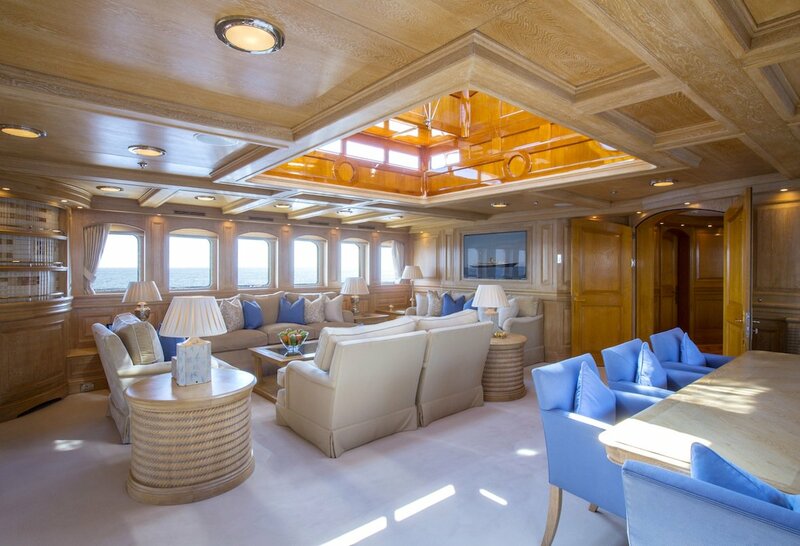 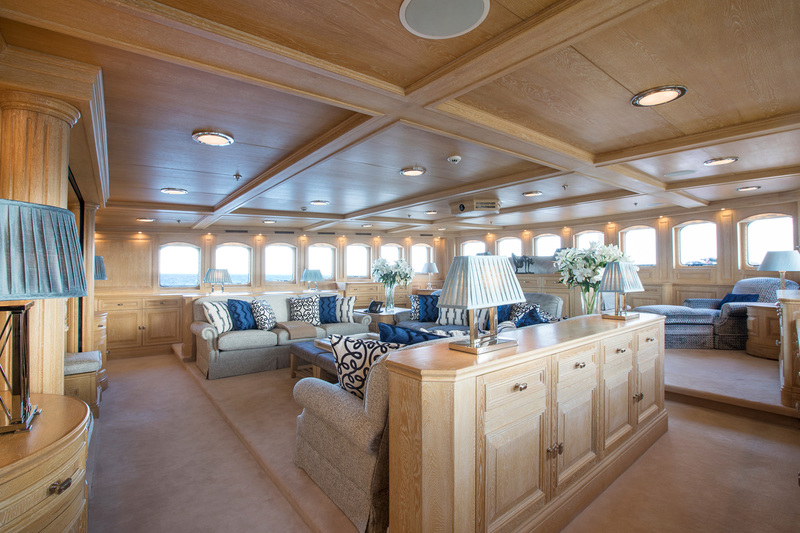 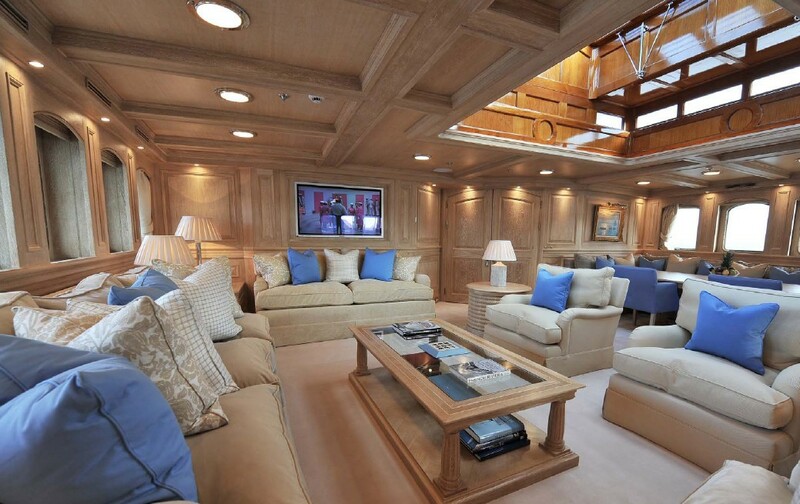 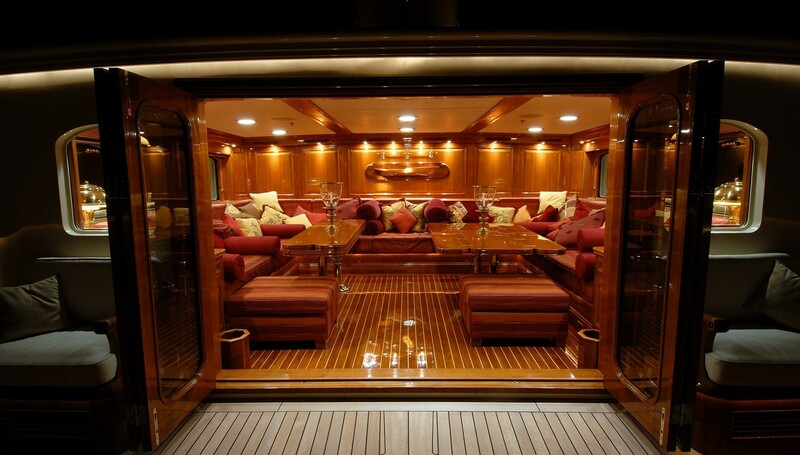 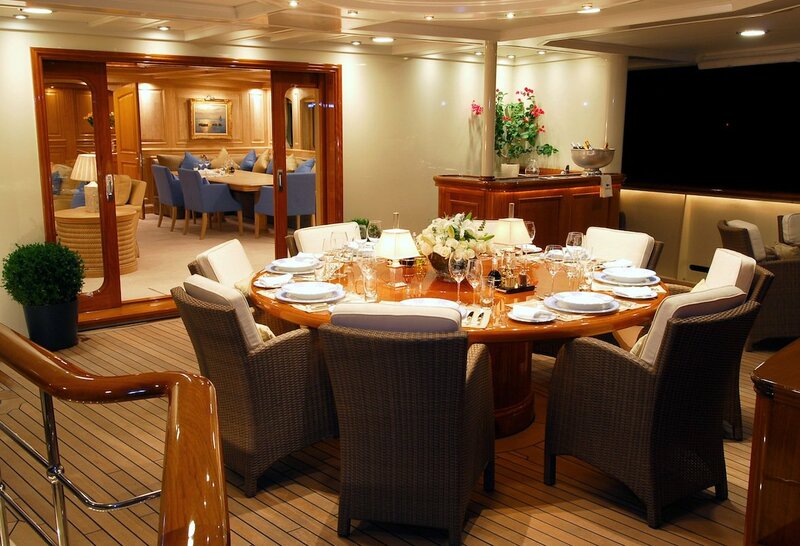 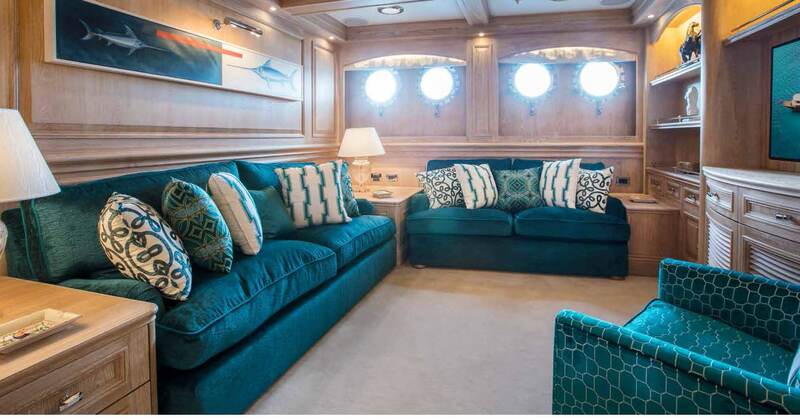 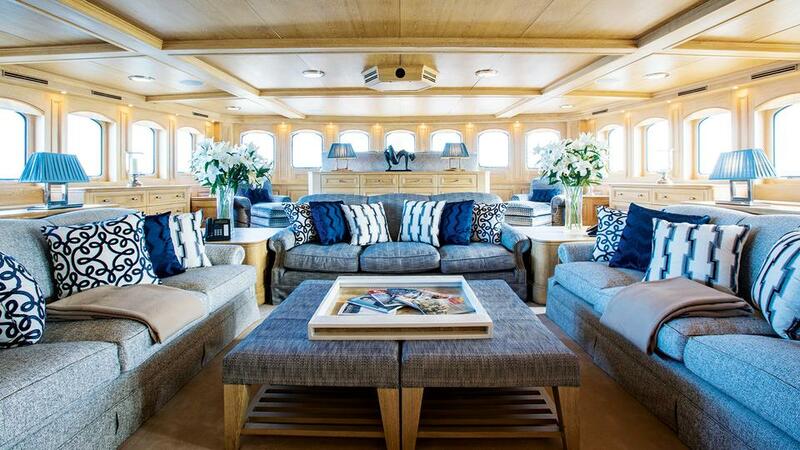 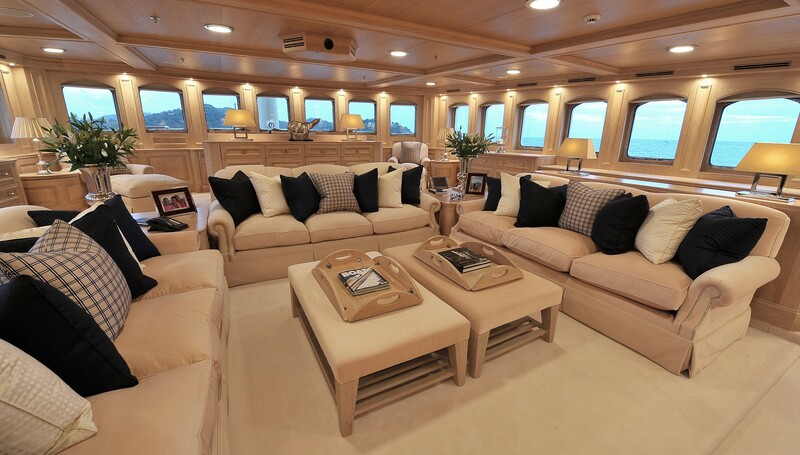 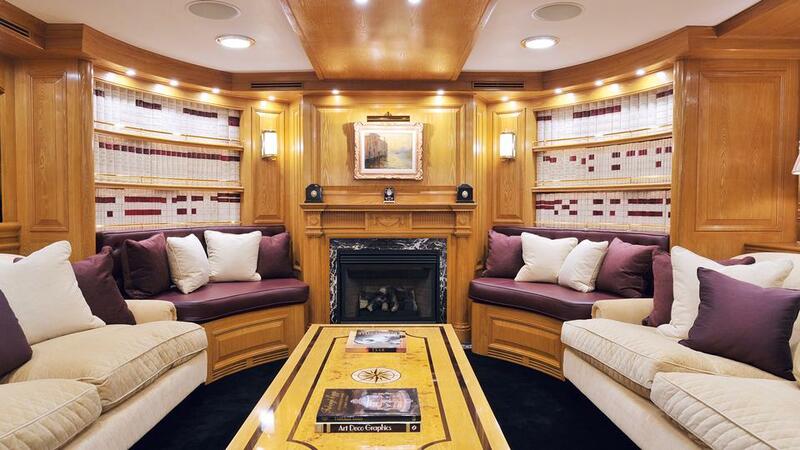 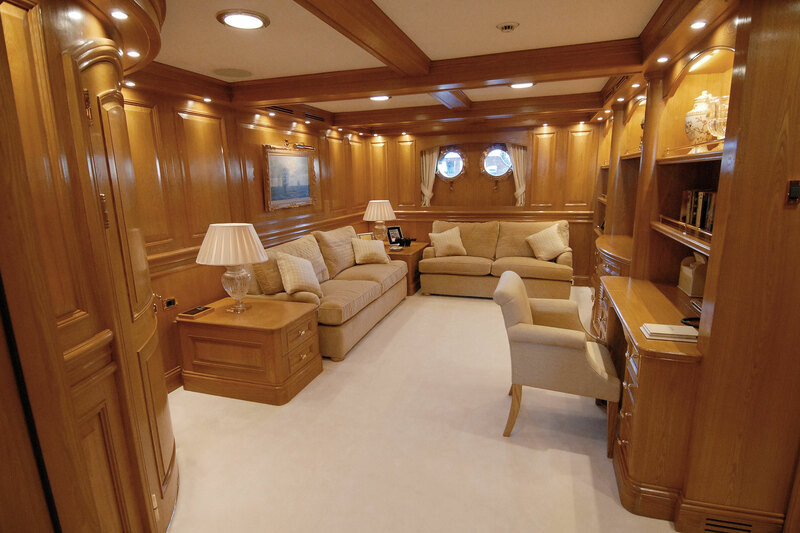 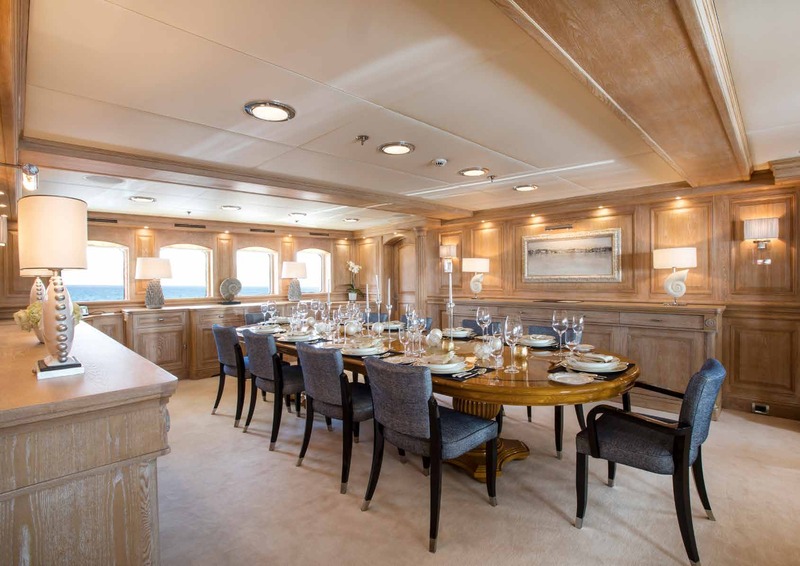 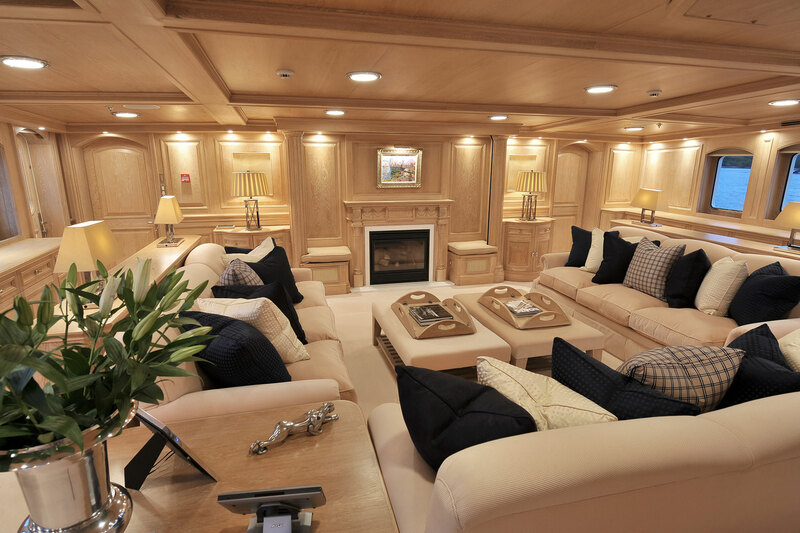 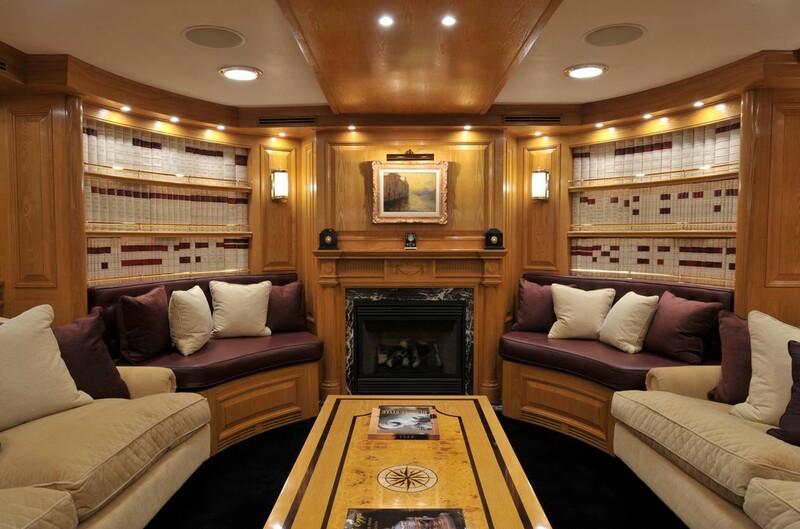 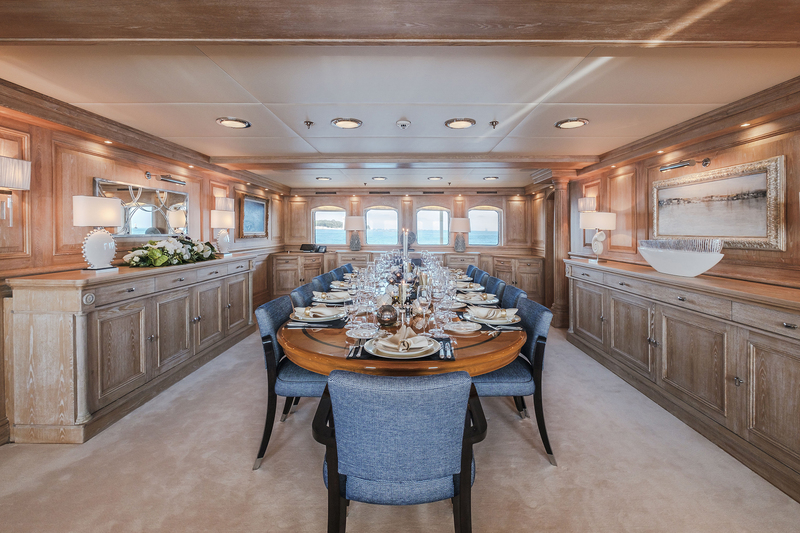 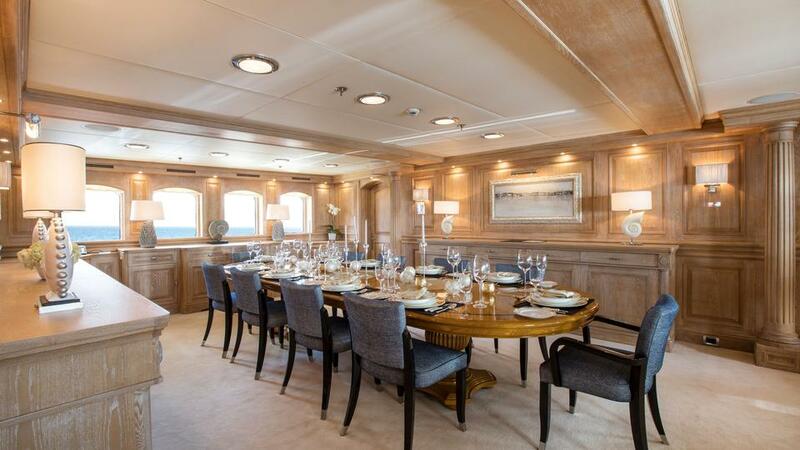 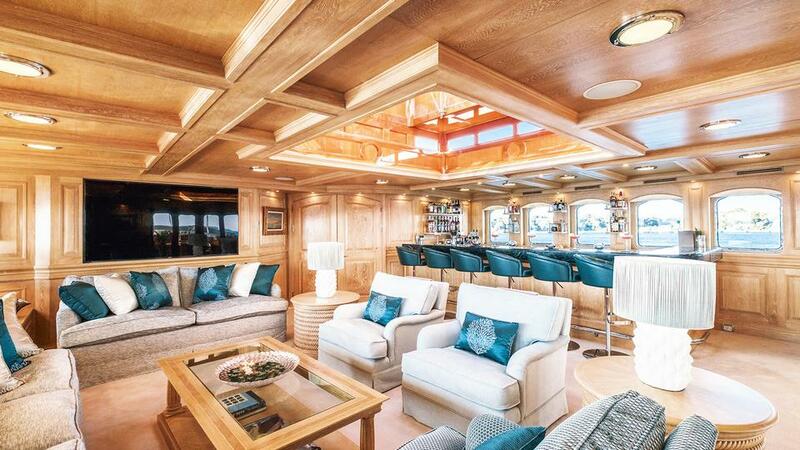 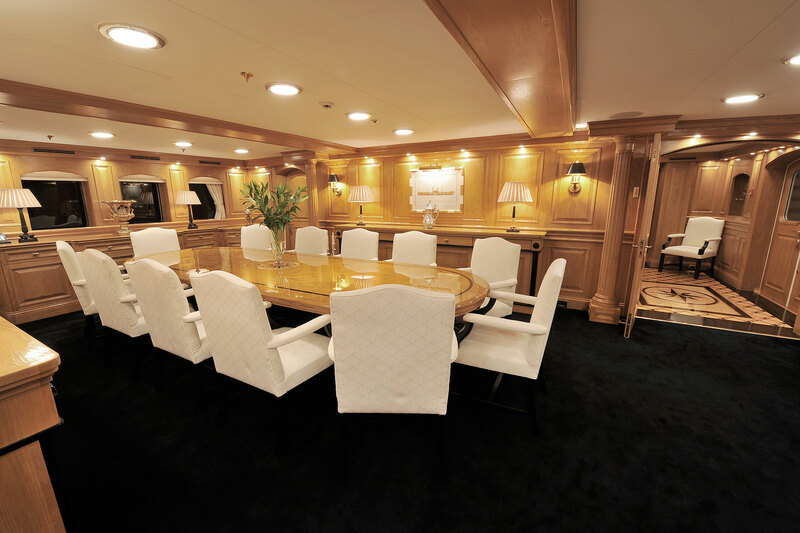 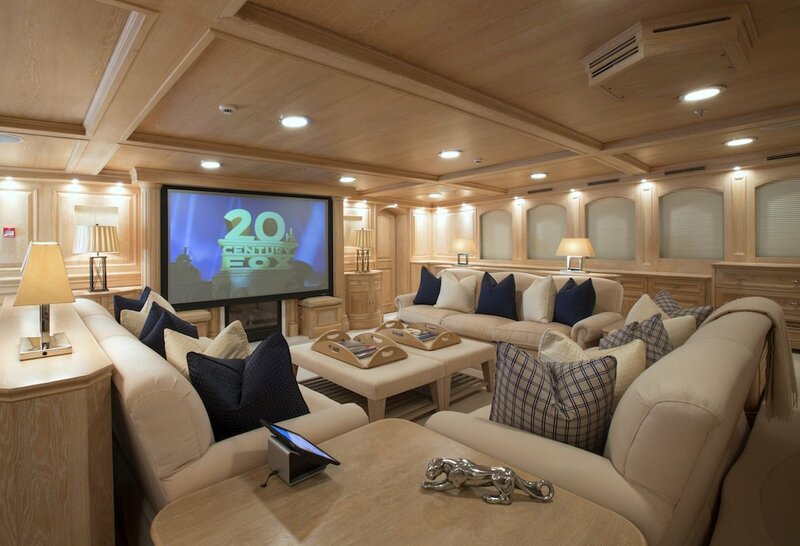 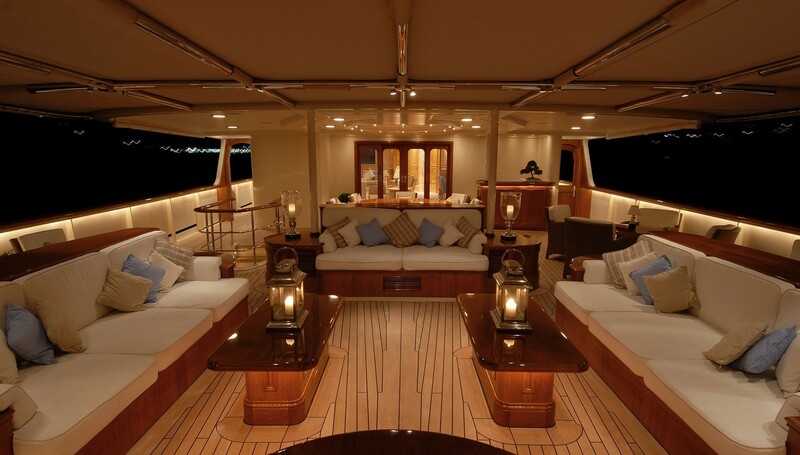 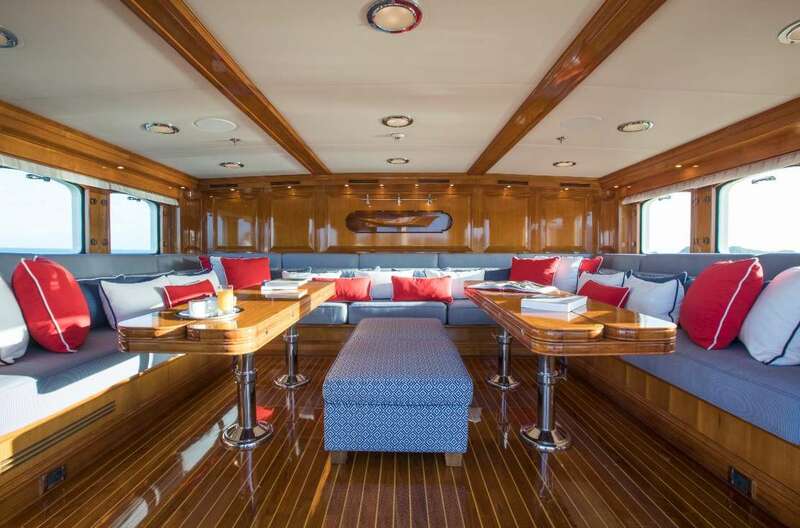 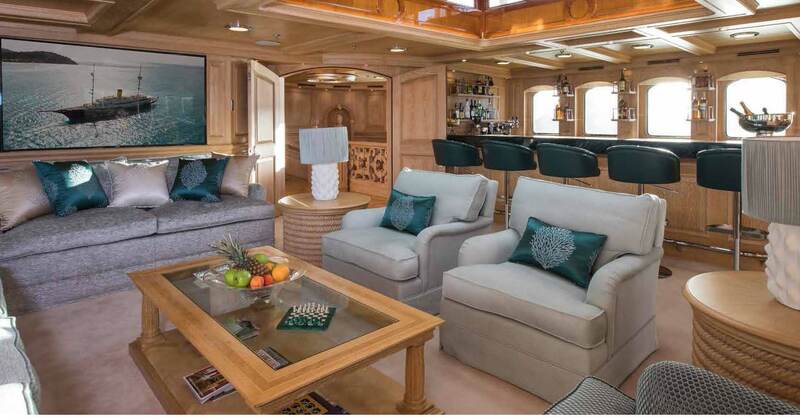 On the starboard side, there is a smaller seating area for more close conversation and a games table to the aft will provide hours of entertainment to family and friends. 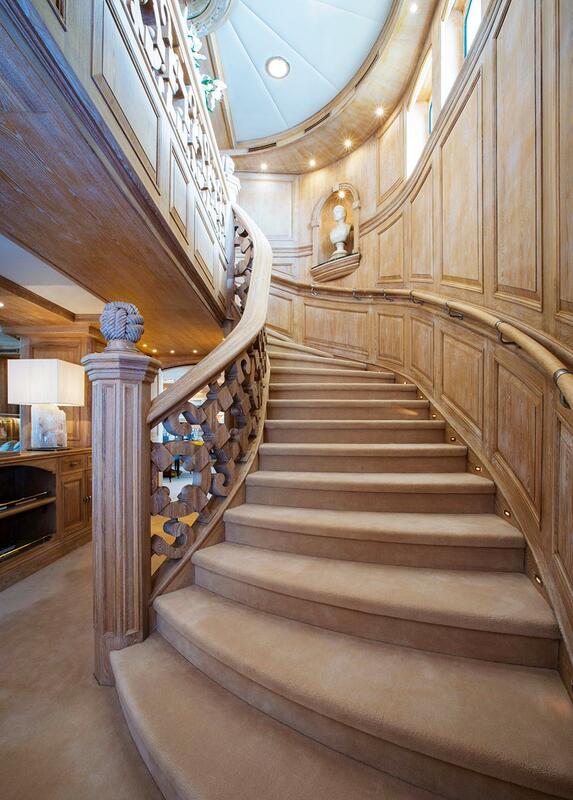 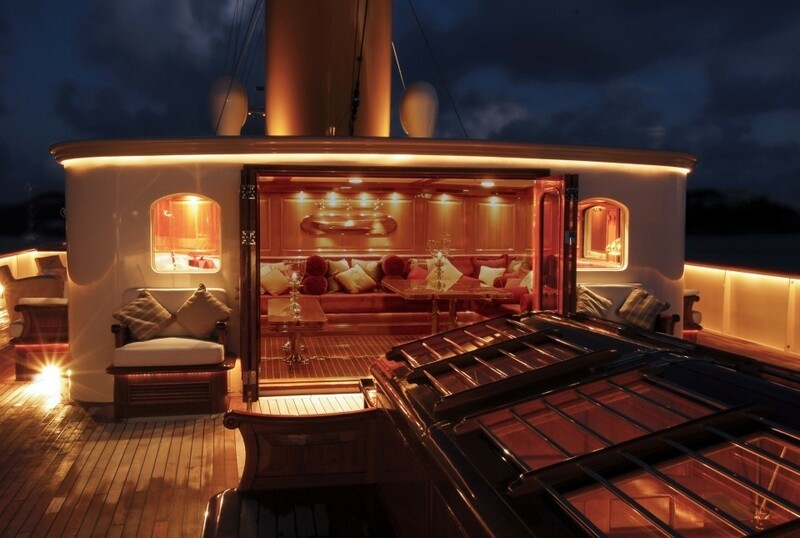 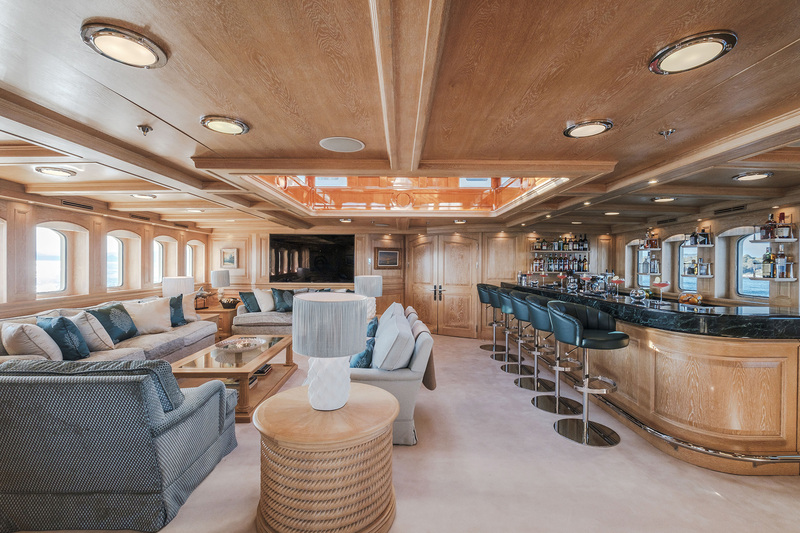 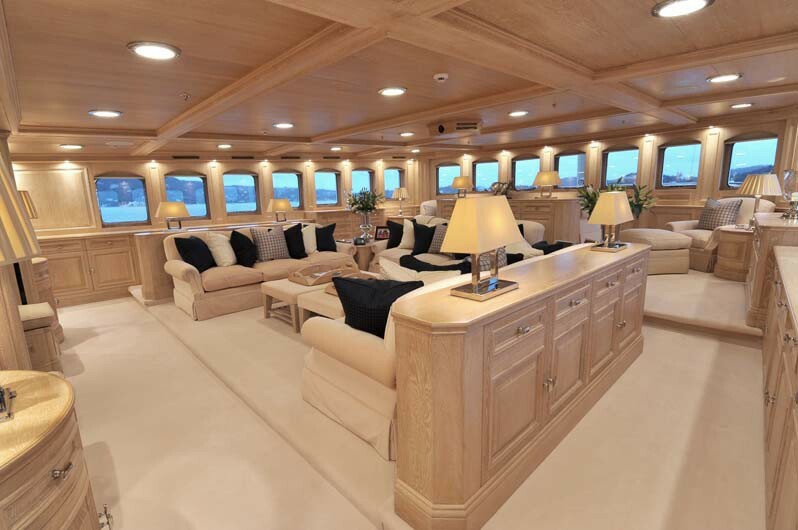 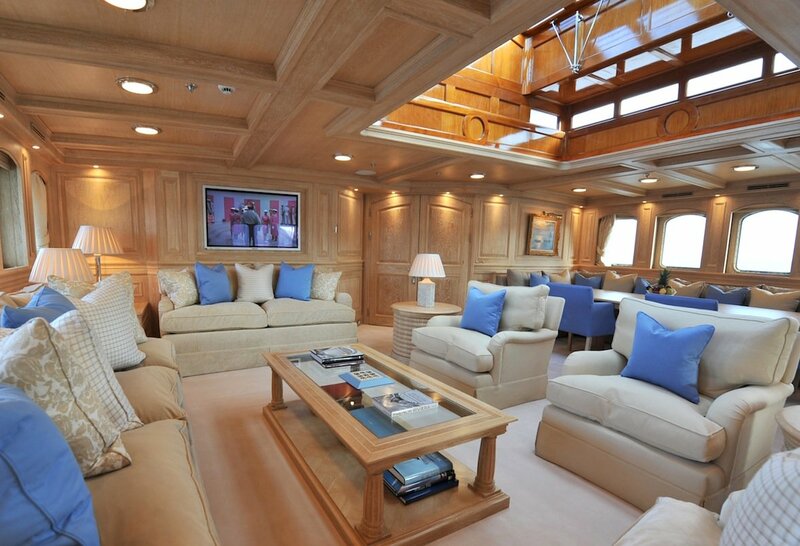 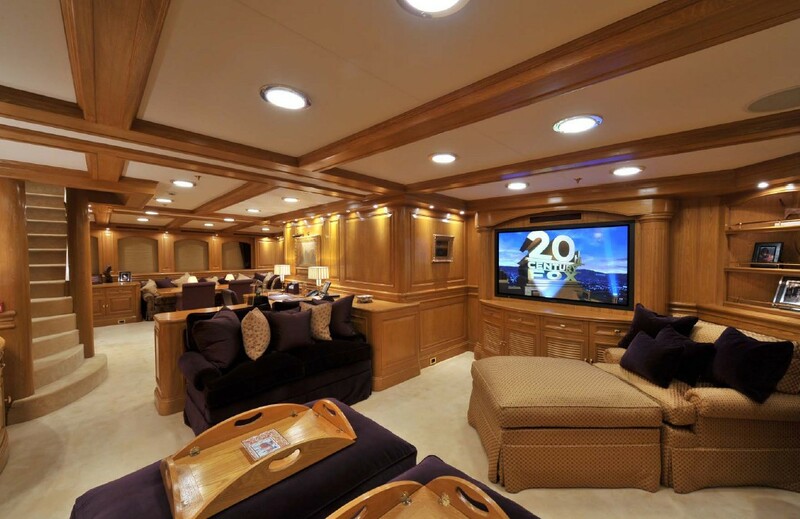 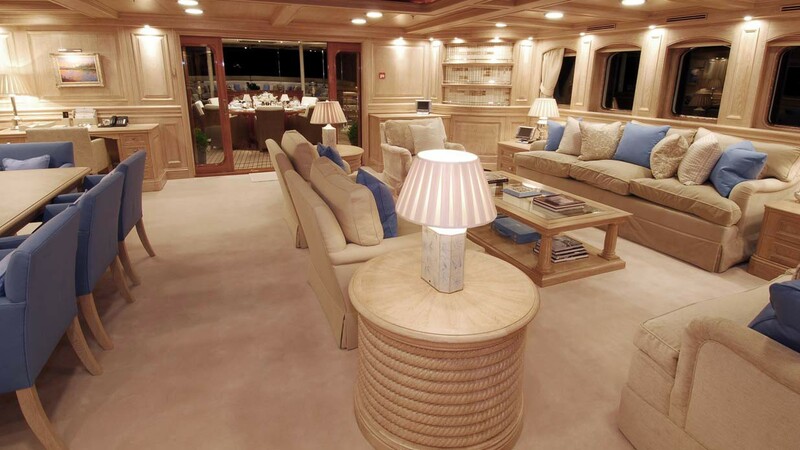 The main deck and the upper deck are connected by a stunning broad staircase, and the landing leads to a forward media room and the aft sky lounge with a forward gym. 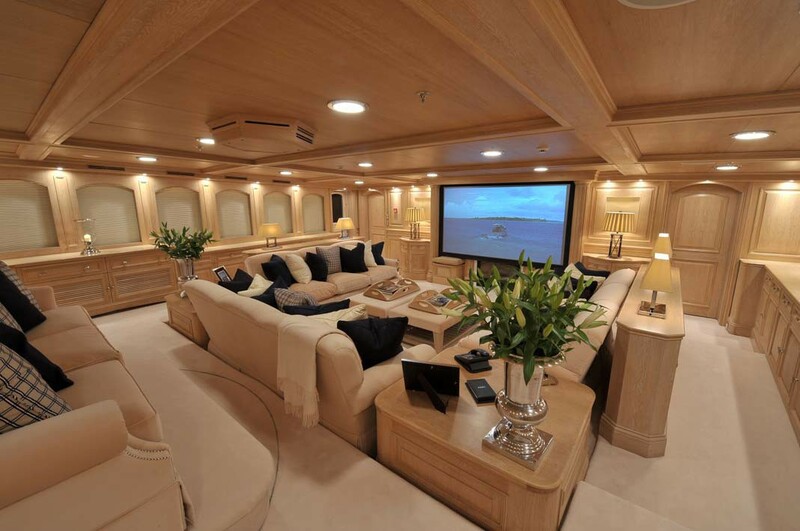 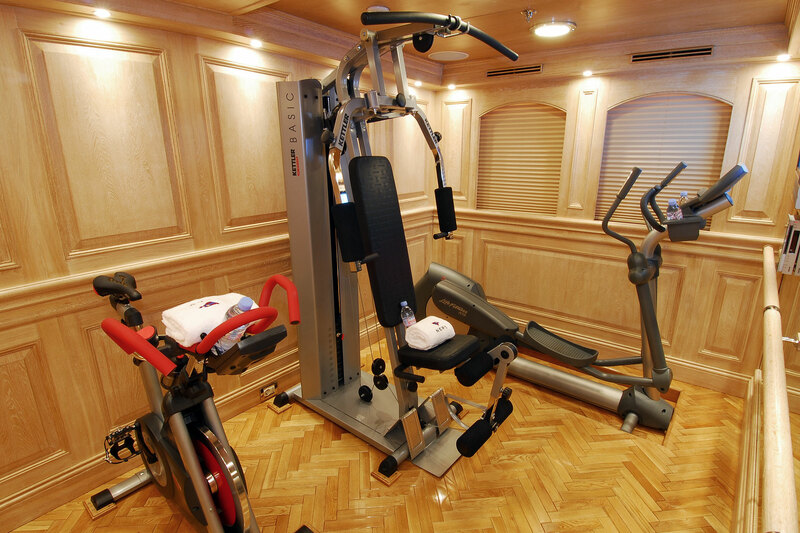 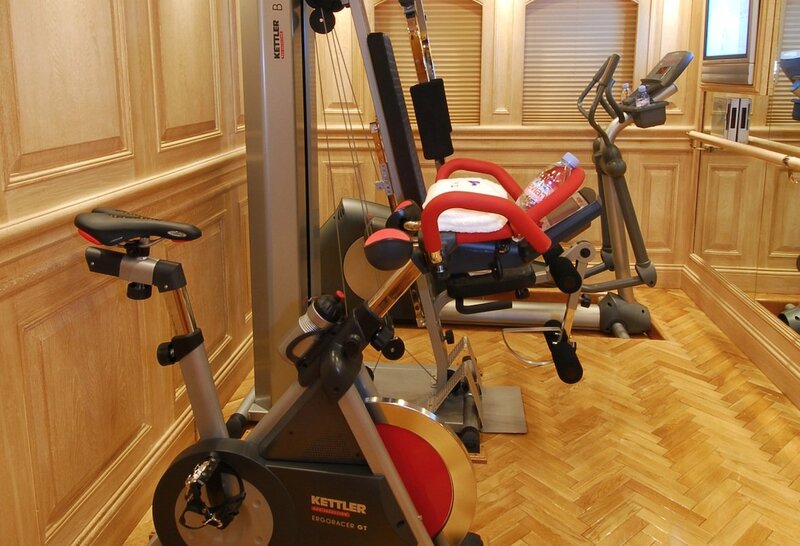 The media room has an excellent sense of volume due to its stepped layout and considerate elbow room afforded to each. 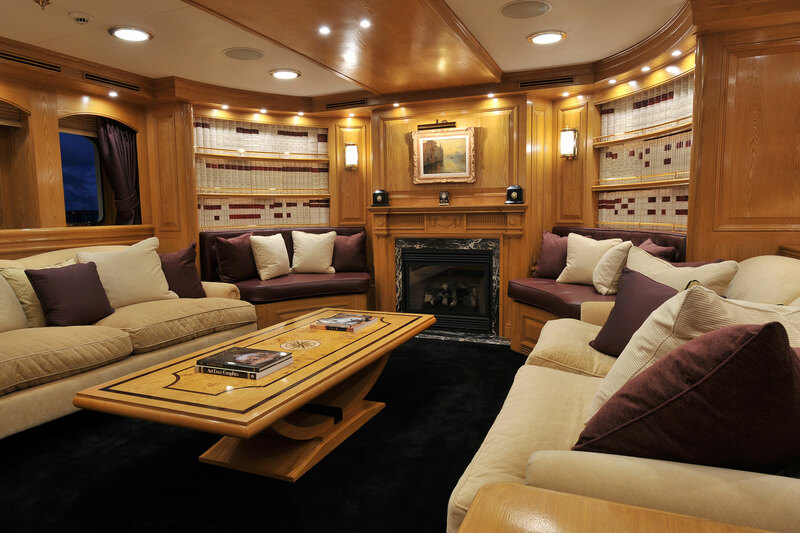 The drop-down screen conceals itself during the day for the fireplace to be on display. 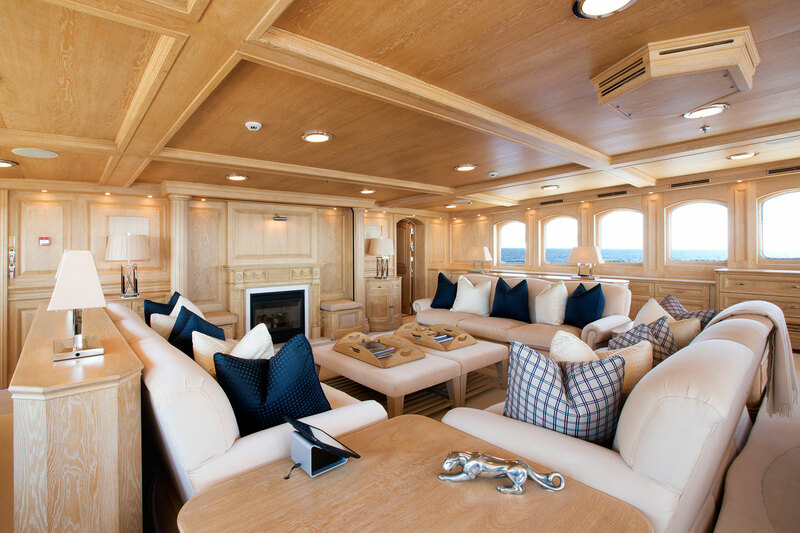 Chaise loungers towards the bow ensure guests can stretch out to watch a film or spend time on reading, while natural light pours through the many windows during the day to create an ideal observation lounge. 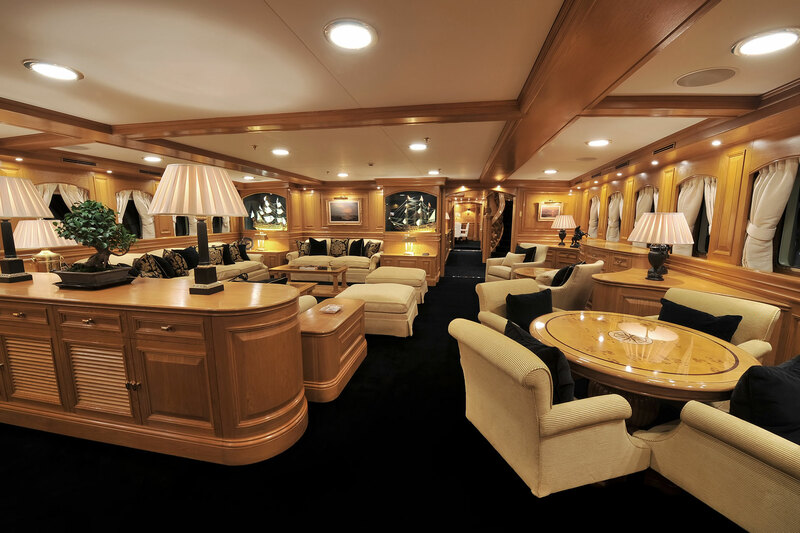 The sky lounge mimics the beautiful tones of the main salon and takes advantage of the added benefit of skylights to illuminate the occasion. 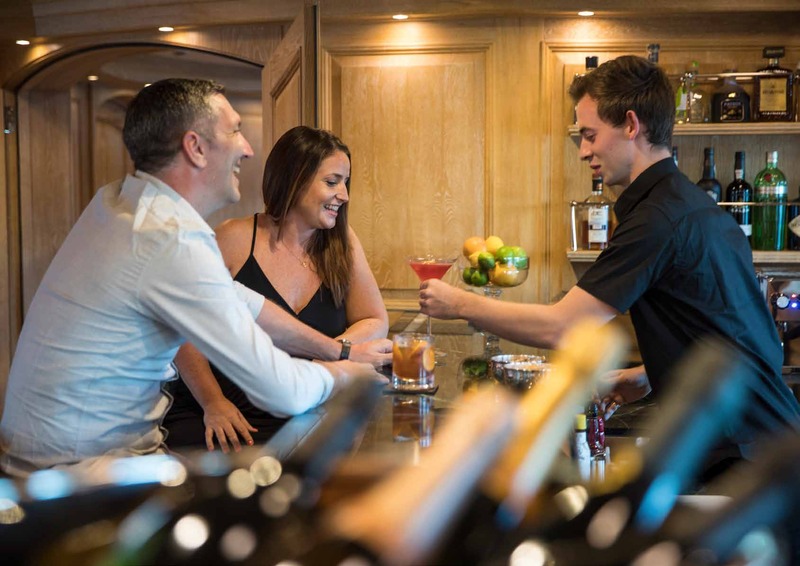 The port bar has an excellent selection of drinks which guests can sample while they catch up on the latest sports on the widescreen TV facing aft of the starboard sofas. 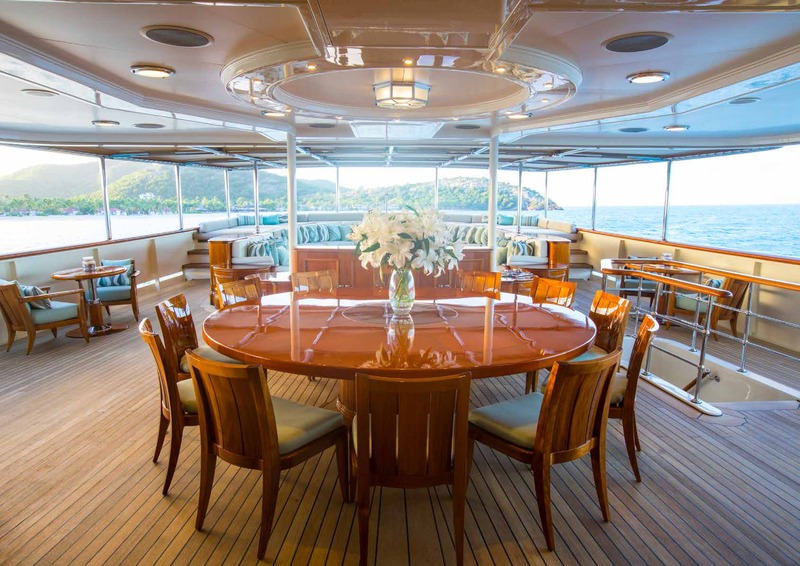 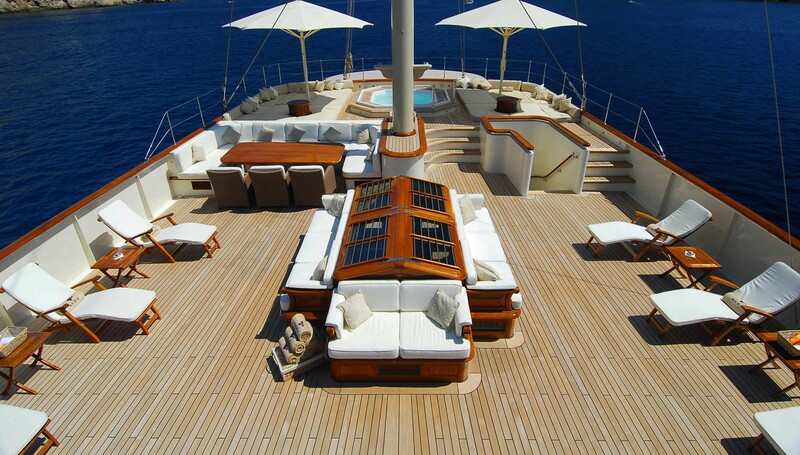 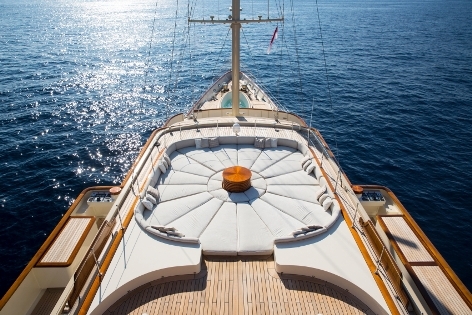 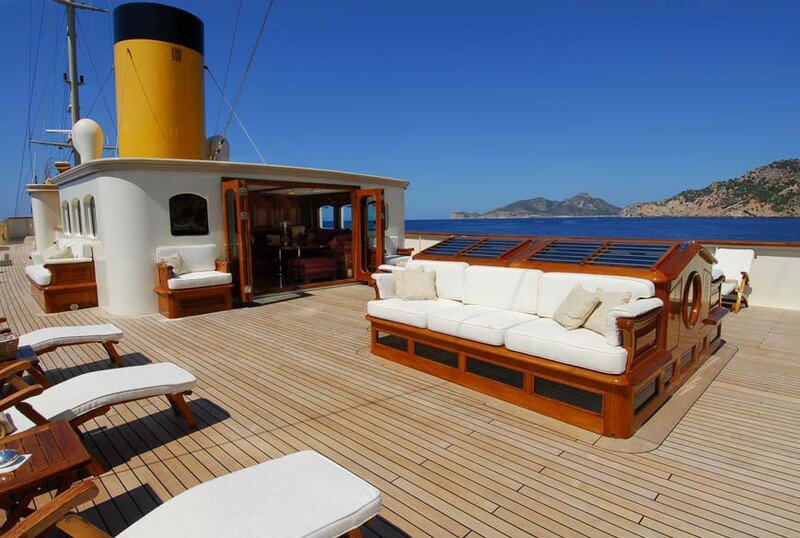 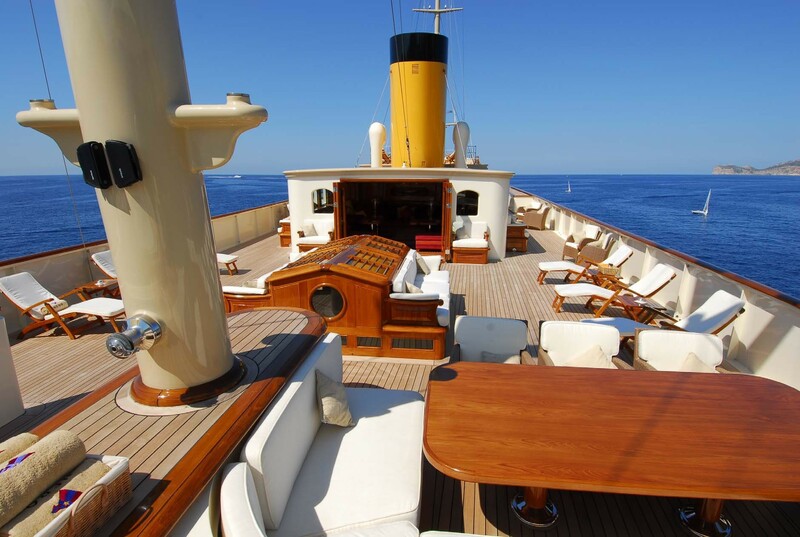 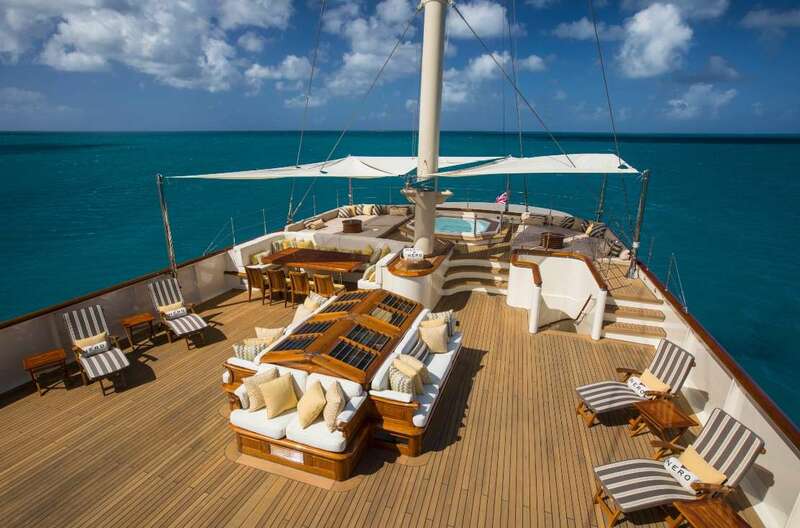 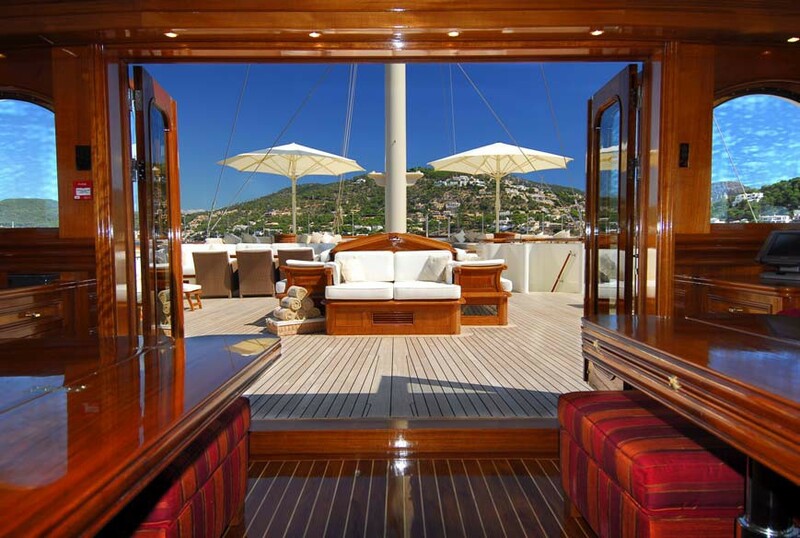 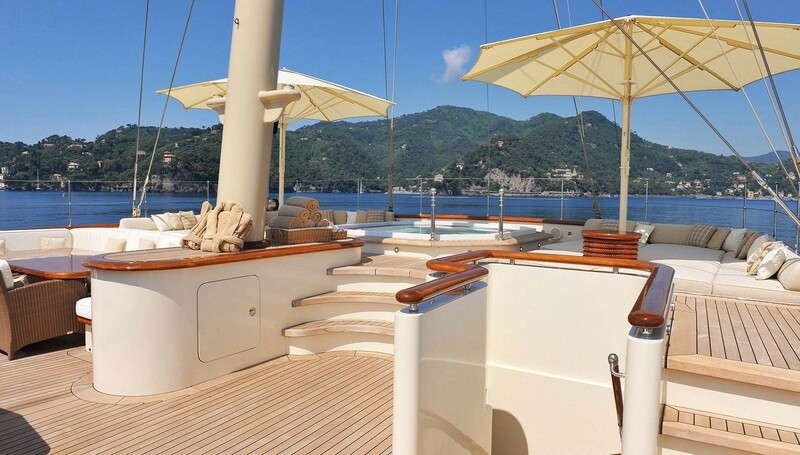 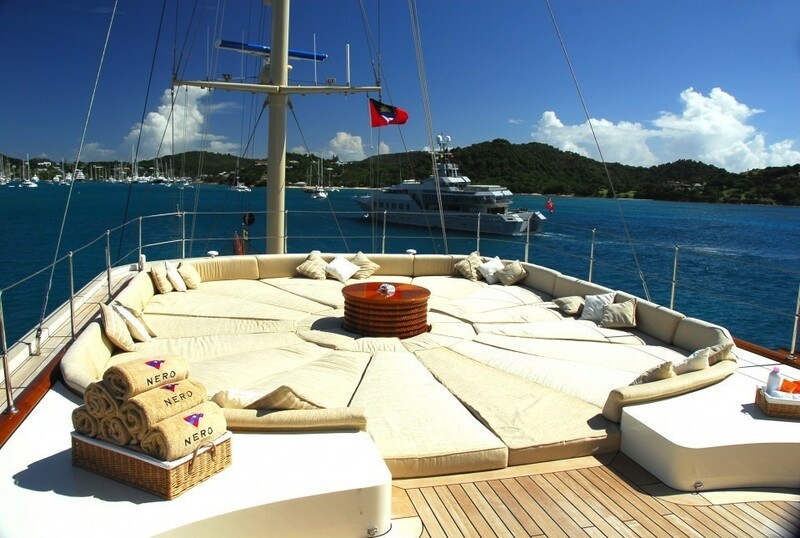 On the sundeck, there is one additional lounge aft of the helm station where guests can marvel at the views in the cool shade. 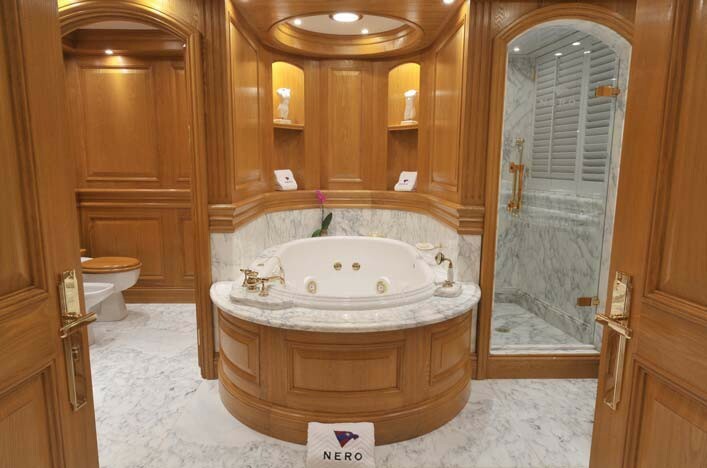 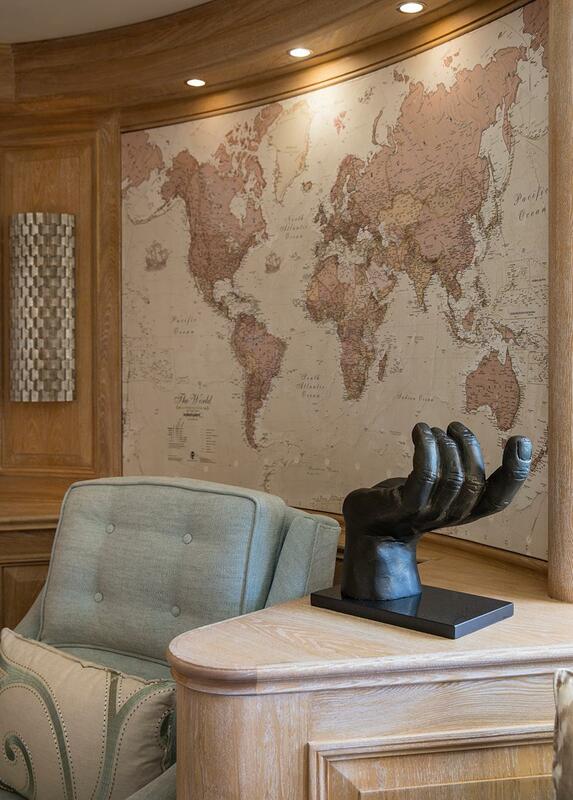 NERO boasts a massive Owner’s duplex apartment incorporating a substantial private living room area and dining saloon, Owner’s stateroom, large his and hers bathrooms, dressing area, private stairs to an observation lounge and cinema, Owner’s private office and guest W.C. 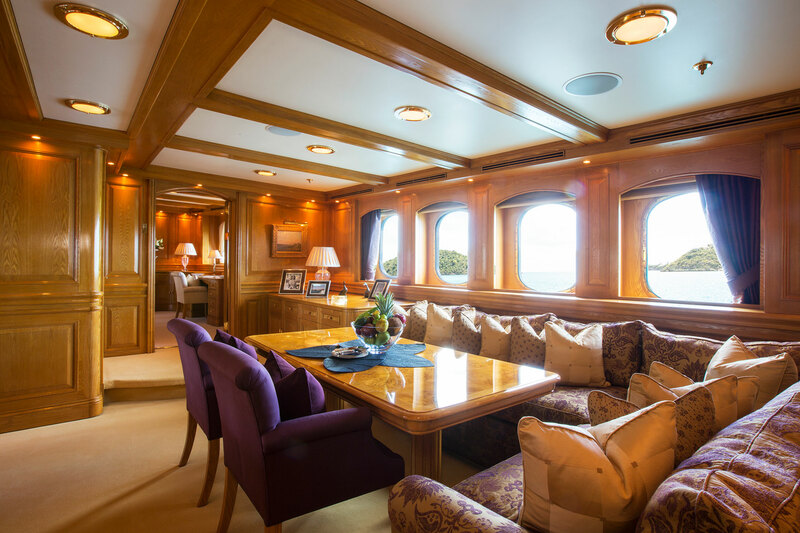 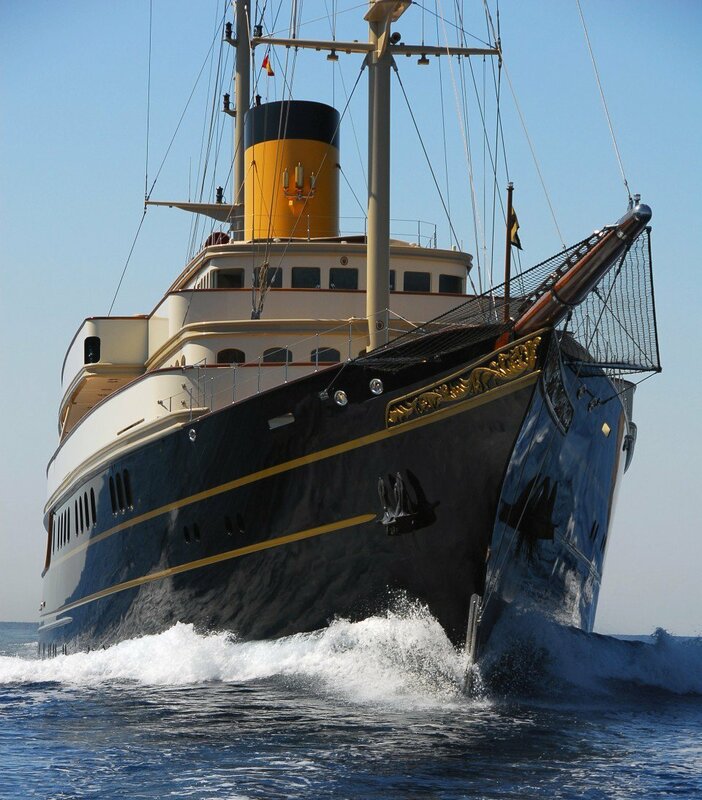 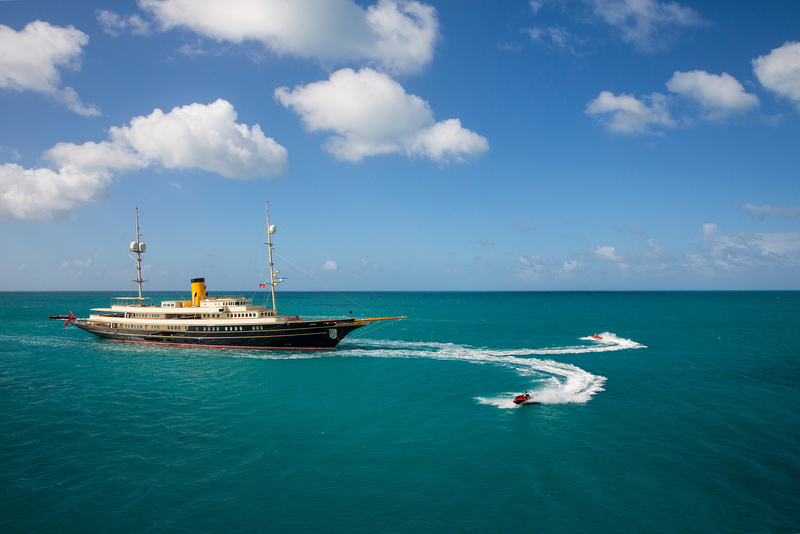 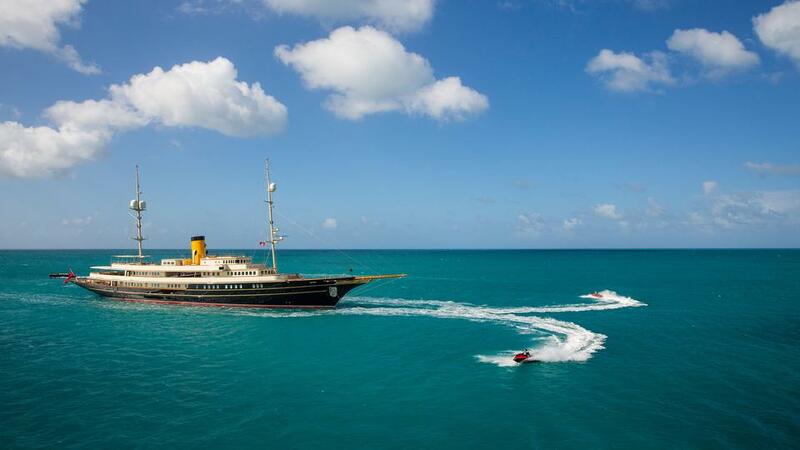 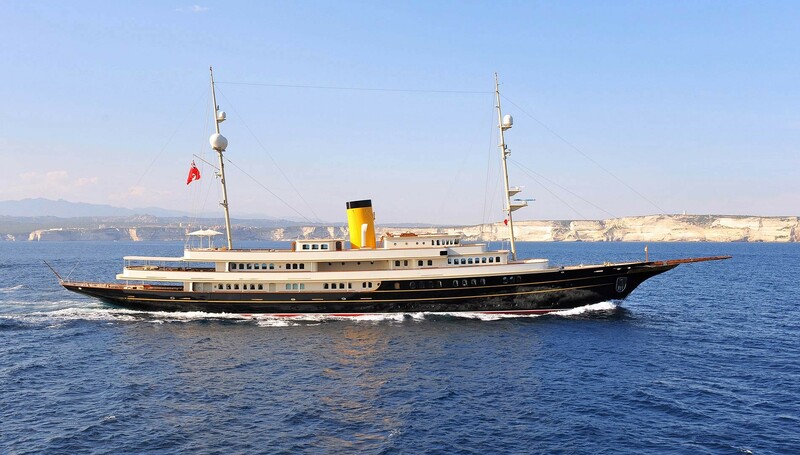 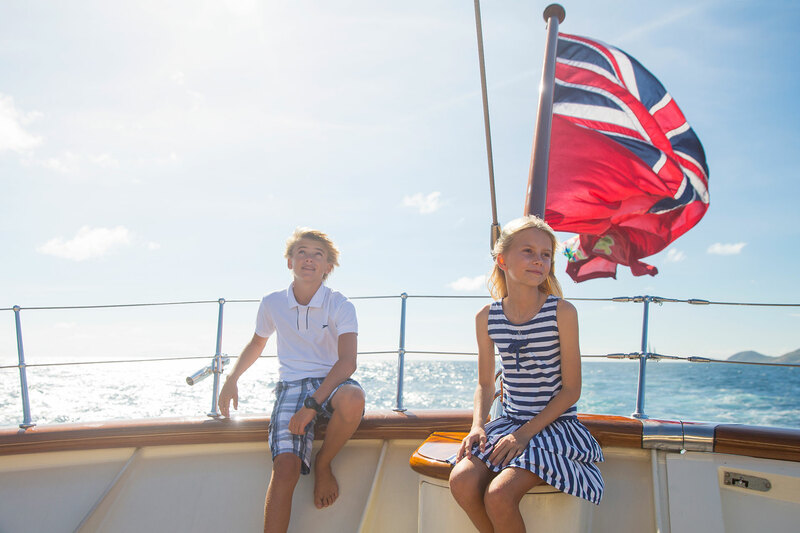 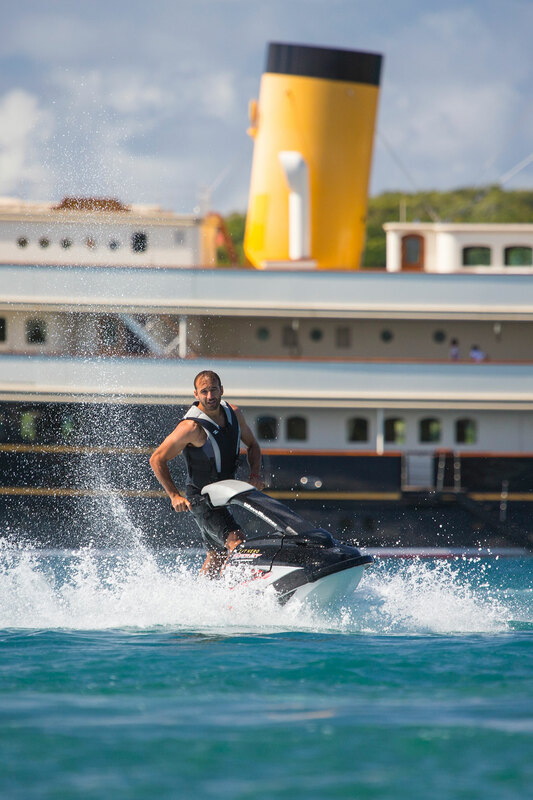 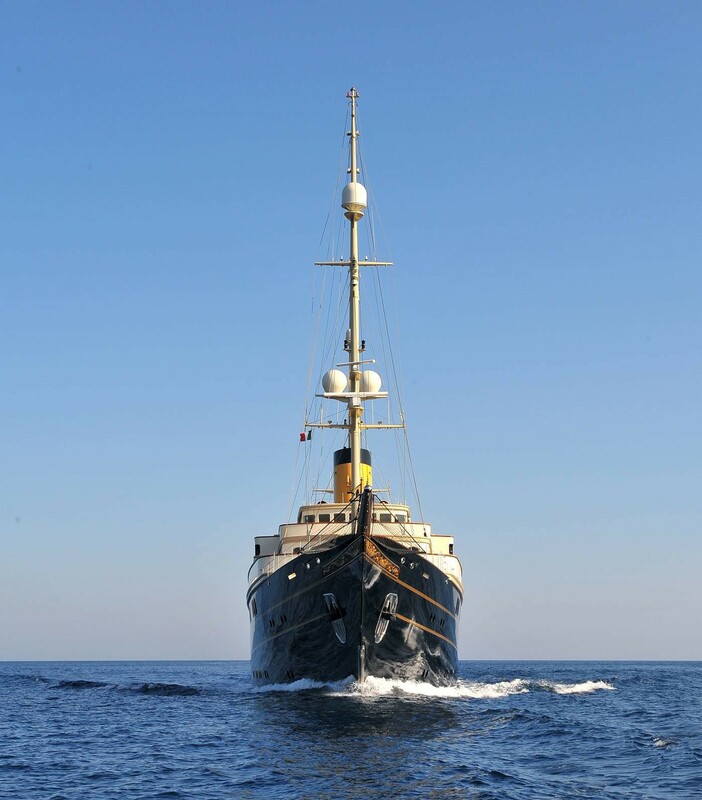 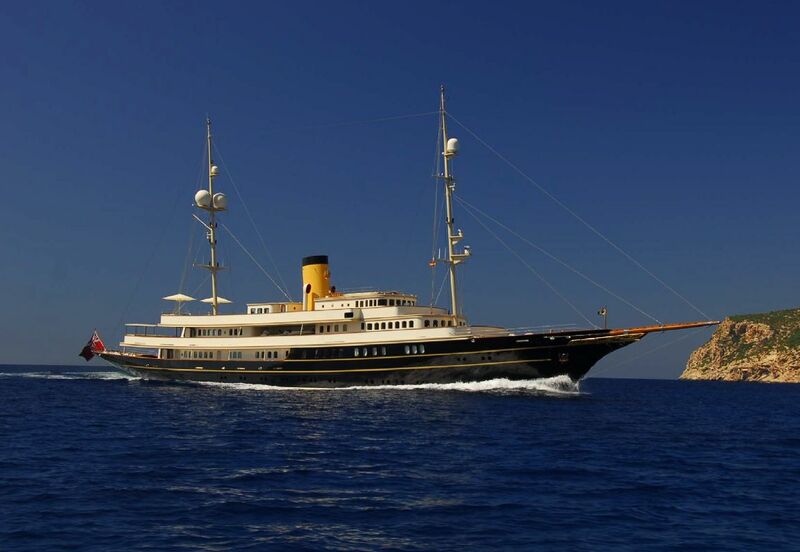 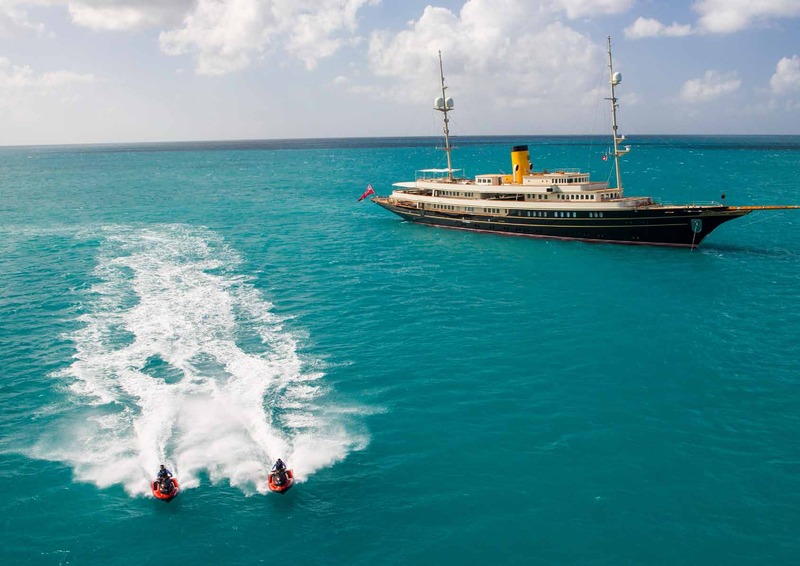 Guests are accommodated in two VIP suites and two double/twin staterooms, all located in the midships section of the yacht ensuring the maximum level of comfort in all sea conditions. 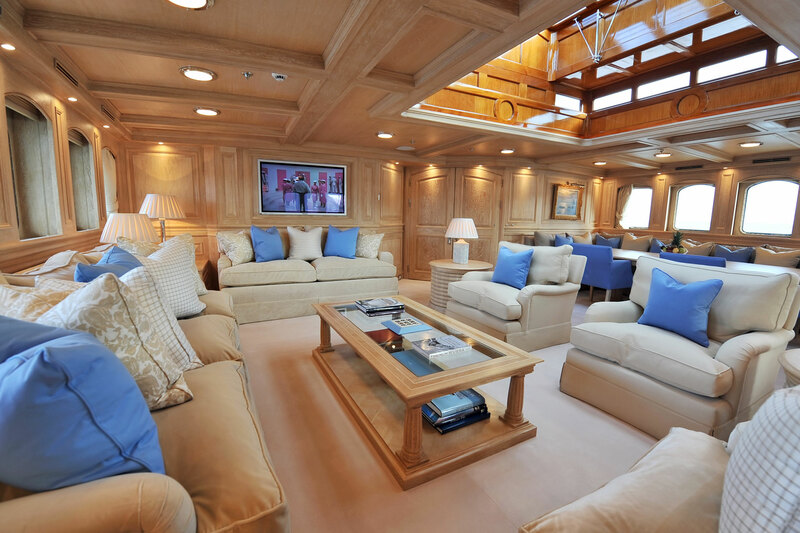 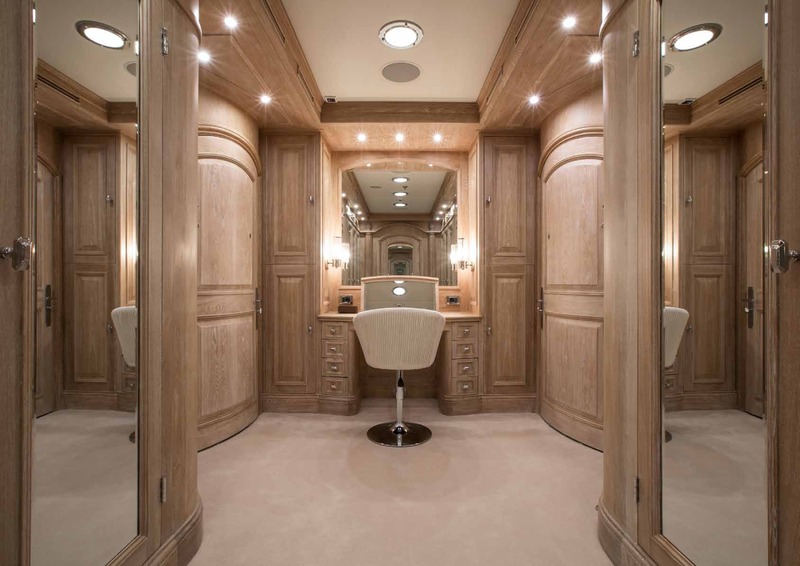 Each VIP cabin also boasts a private saloon with plasma screen, one also boasting separate his and hers bathrooms and a large dressing area, the other an extremely spacious bathroom. 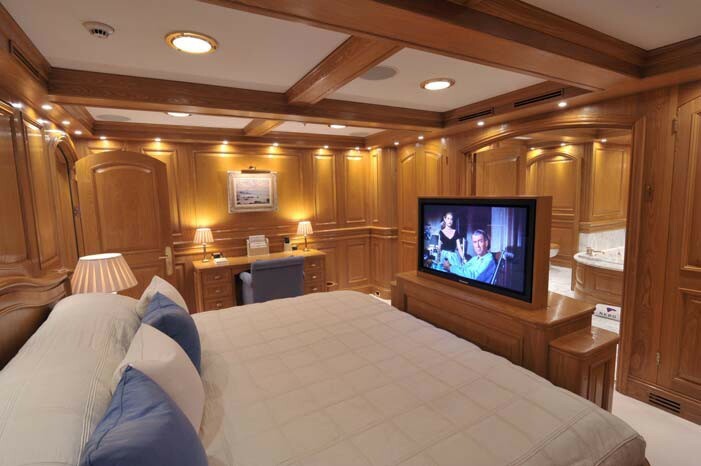 The remaining guest suite can be divided into two separate cabins with ensuite facilities if required. 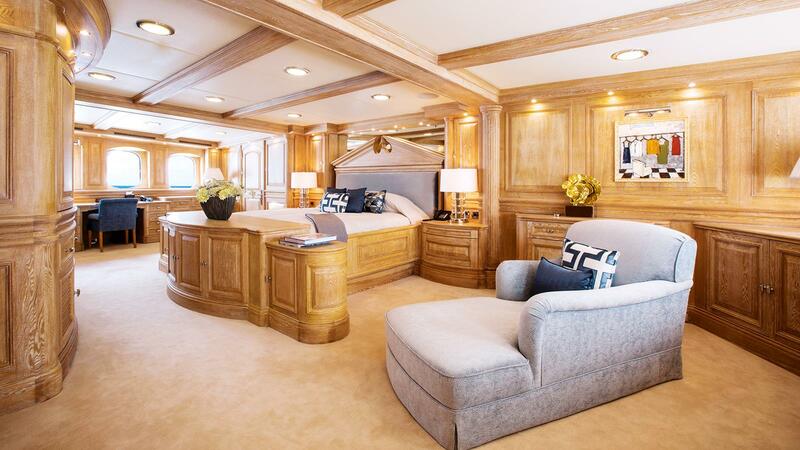 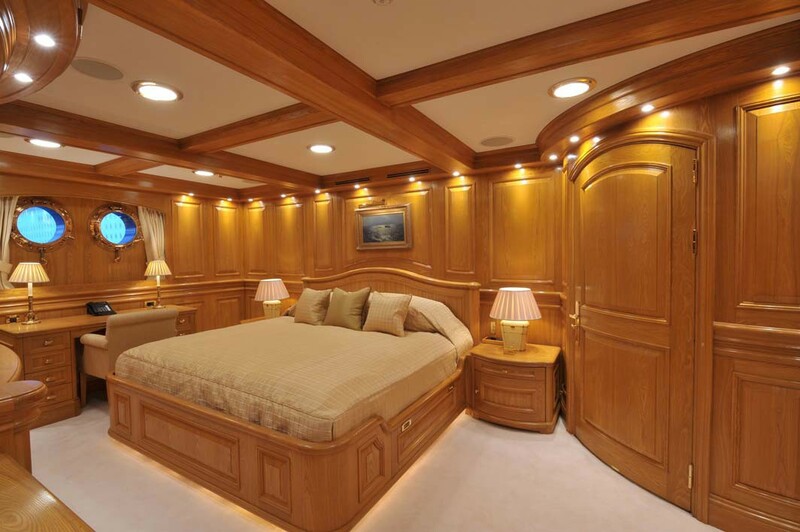 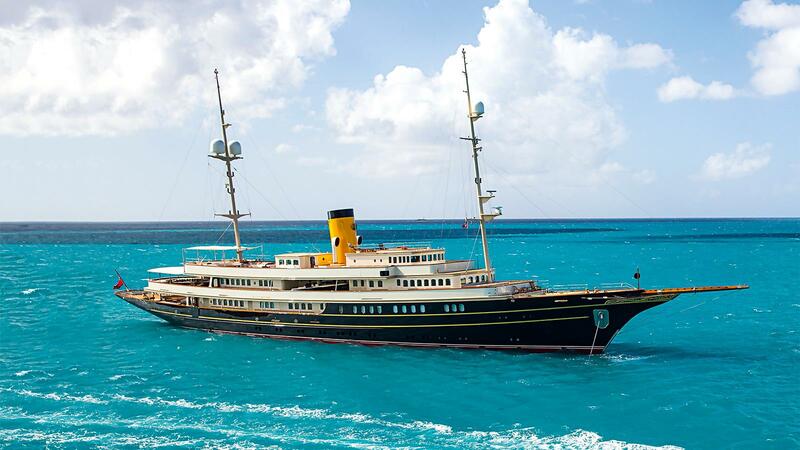 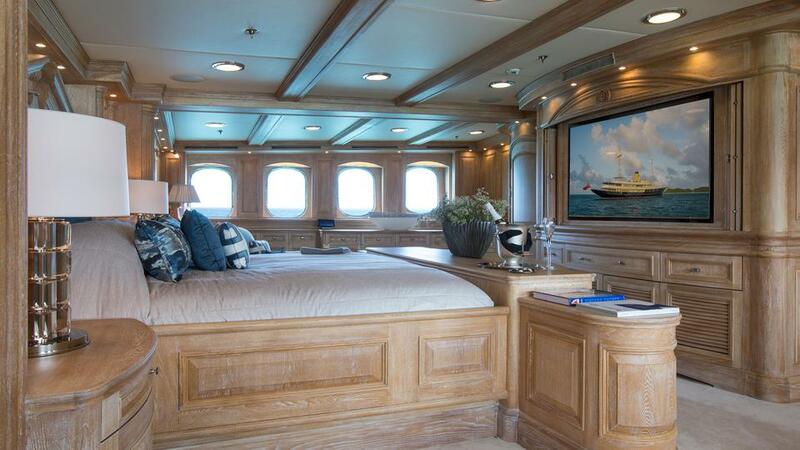 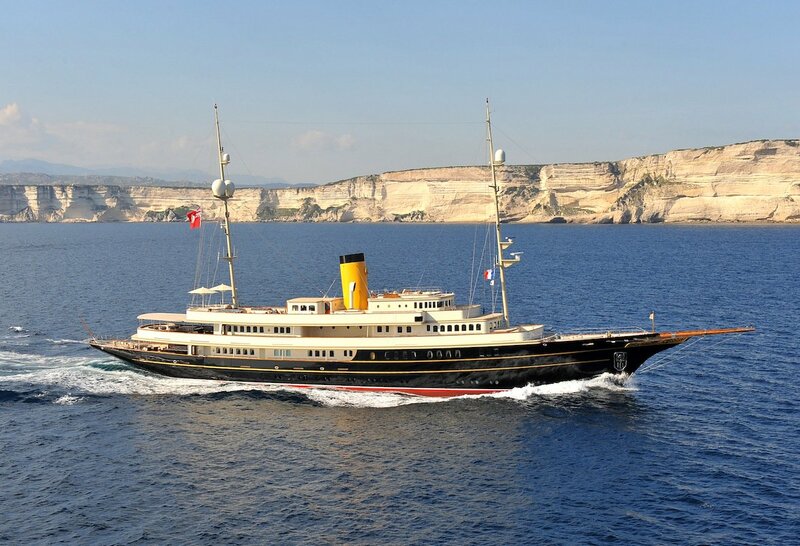 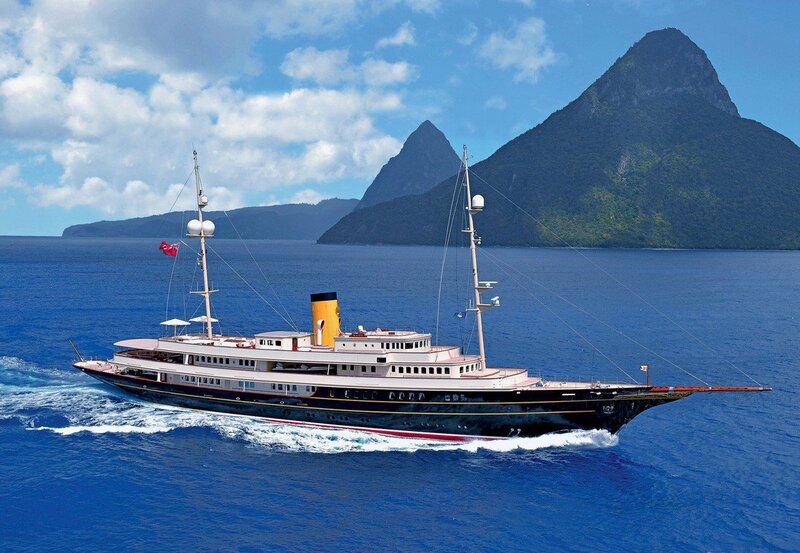 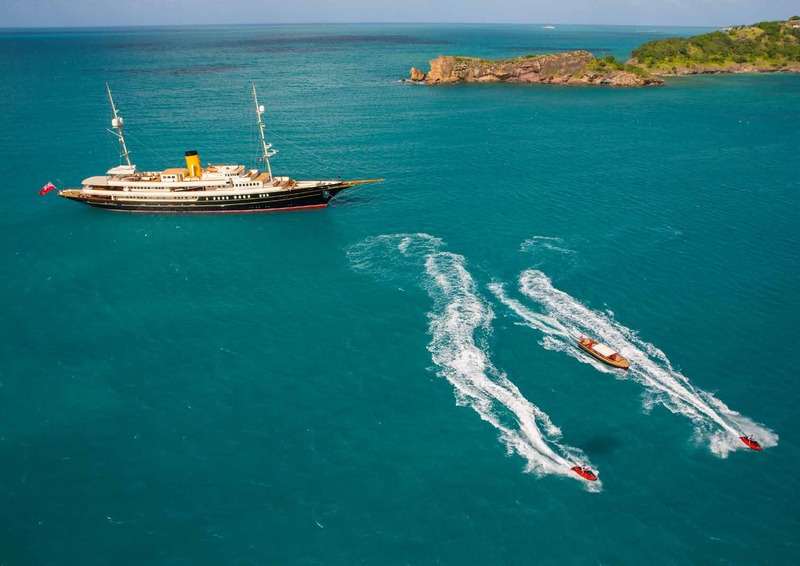 Once divided these two staterooms can be configured as twin beds or double beds, as the occasion requires.